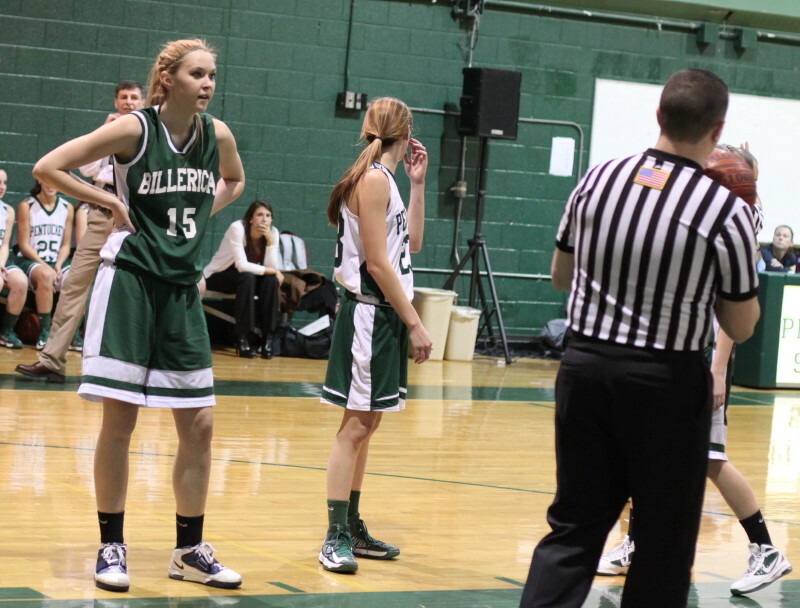 Alex Moore lines up a free throw. 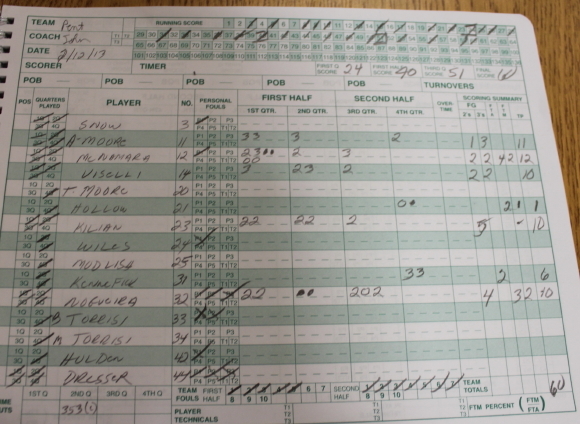 The Sachems made sixteen in the second half. 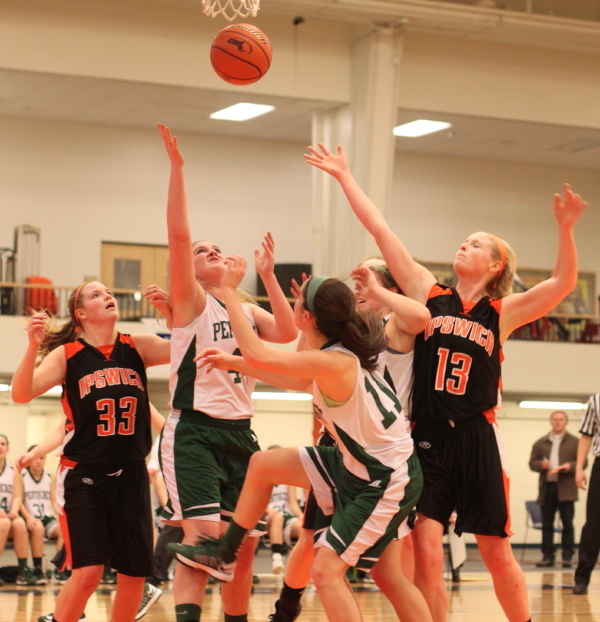 (Beverly) Pentucket never seems to run out of ways to defeat other teams. 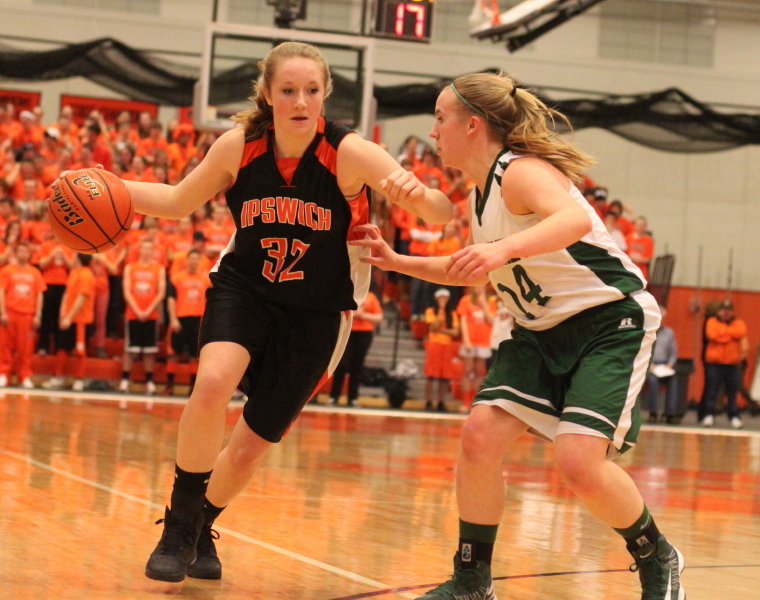 Credit defense and foul shooting as keys to the win over Ipswich. 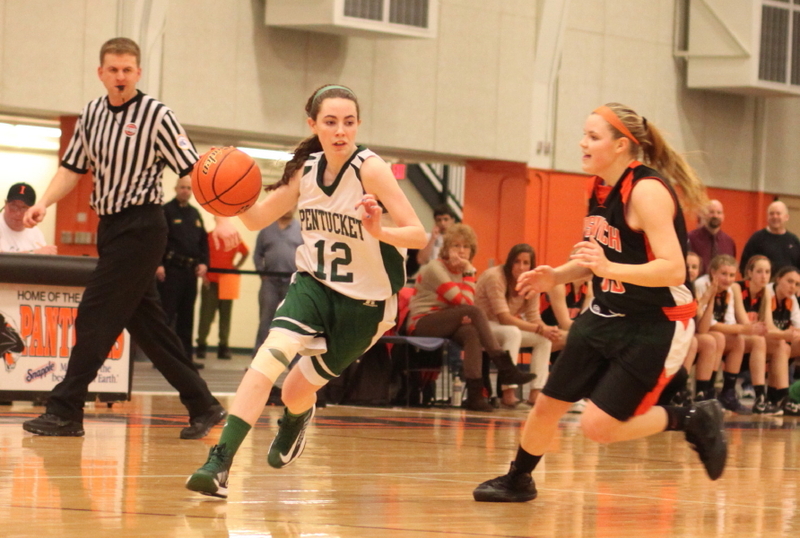 The Sachems (23-1) broke away from a tight three-point game (27-24) in the last minute of the third quarter and won their Division 3 North semifinal match with Ipswich, 46-26, on Wednesday night at Beverly High School. 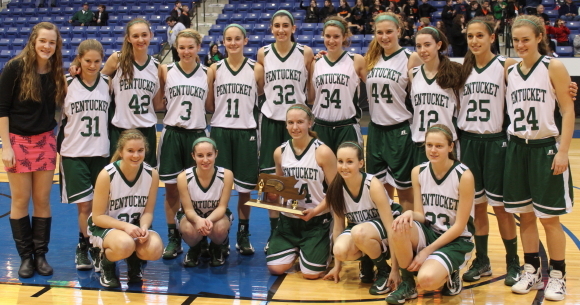 Pentucket will face Watertown in the D3 North finals at the Tsongas Center on Saturday. If you did the math, you now know that Pentucket, over the last nine minutes of this contest, put a 19-2 collection of points on the Tigers. 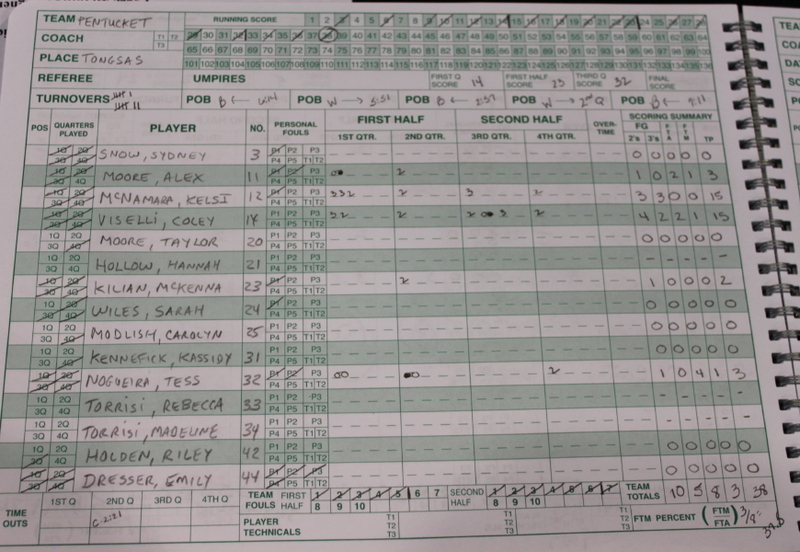 In fact, the last Ipswich points were registered by Julia Davis (jump shot in the lane) with 7:13 left in the game. This was a terribly frustrating outing for a very good Ipswich (19-4) team. They were victimized by turnovers (sixteen by my count) in the first half, put some points together in the third quarter to get to within one possession, and then couldn’t make a shot over the final nine minutes. 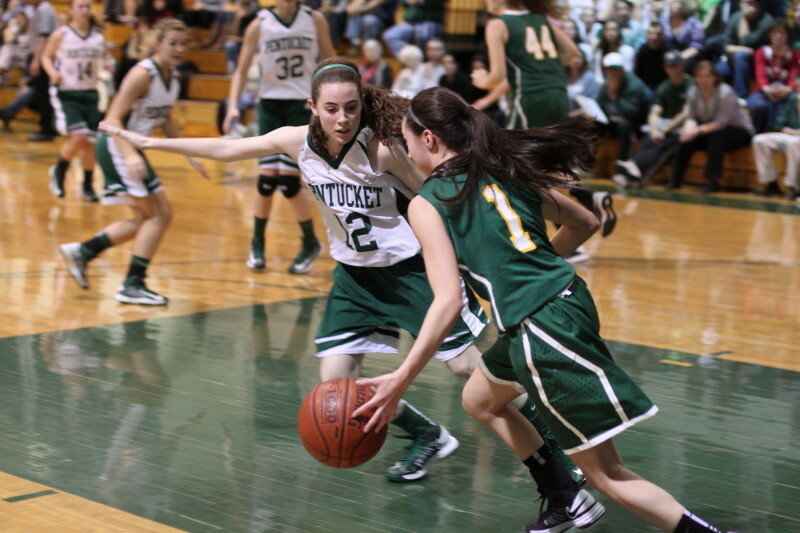 The Pentucket pressure defense had plenty to do with the turnovers and the poor shooting. 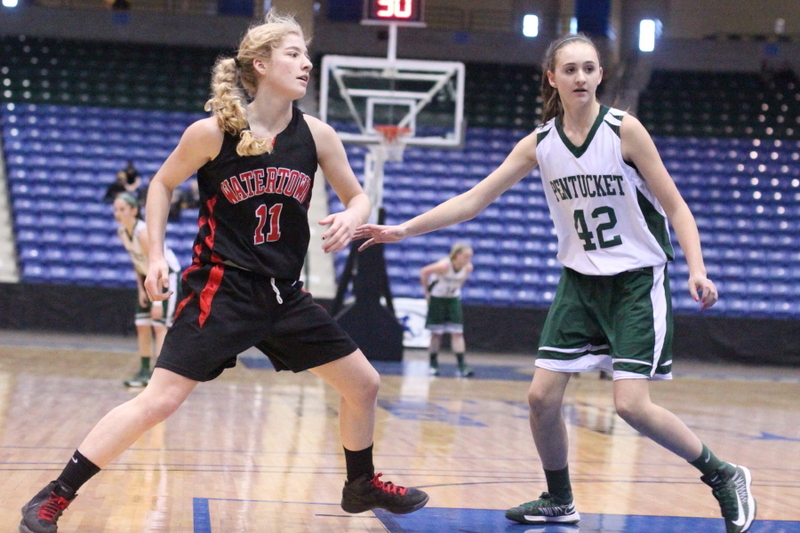 Masey Zegarowski (15 PPG) and Caroline Soucy (10 PPG) saw plenty of defense, especially Masey from Alex Moore. Masey was held to five points and Caroline six points. 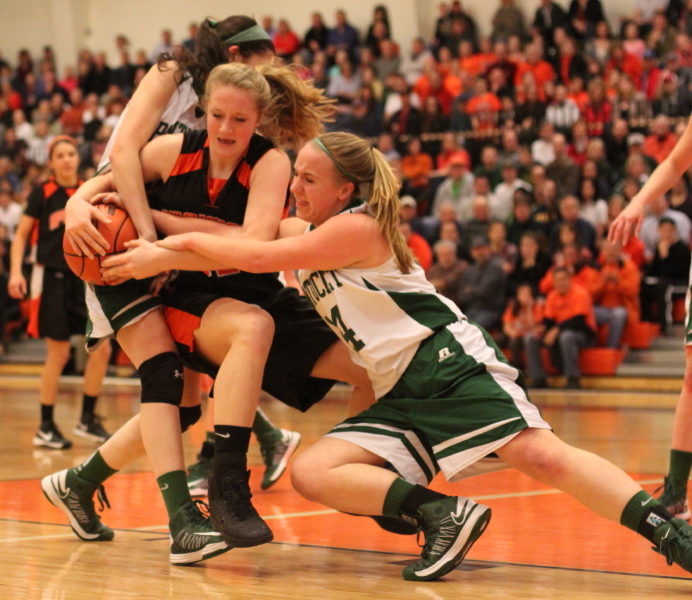 The Sachems’ shooting was scary bad in the first half. They had plenty of looks but were missing shots they usually make. 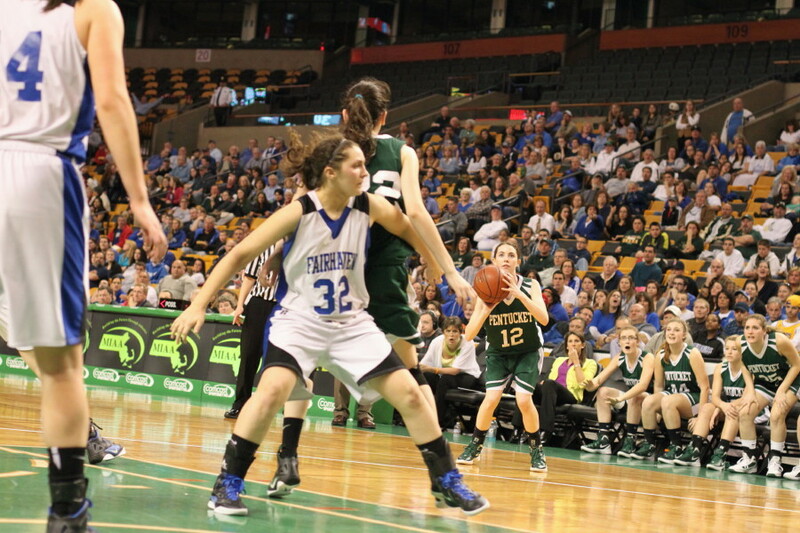 They also had Tess Nogueira get into foul trouble and have to sit through much of the second period. Pentucket led 7-5 after one quarter and 15-12 at the half. The Tigers took the lead (17-15) early in the third quarter on a three by Caroline Soucy and a jump shot by Julia Davis. Now the defending state champs were behind and to add to their trouble had Kelsi McNamara (13 points) on the bench with a sore knee. 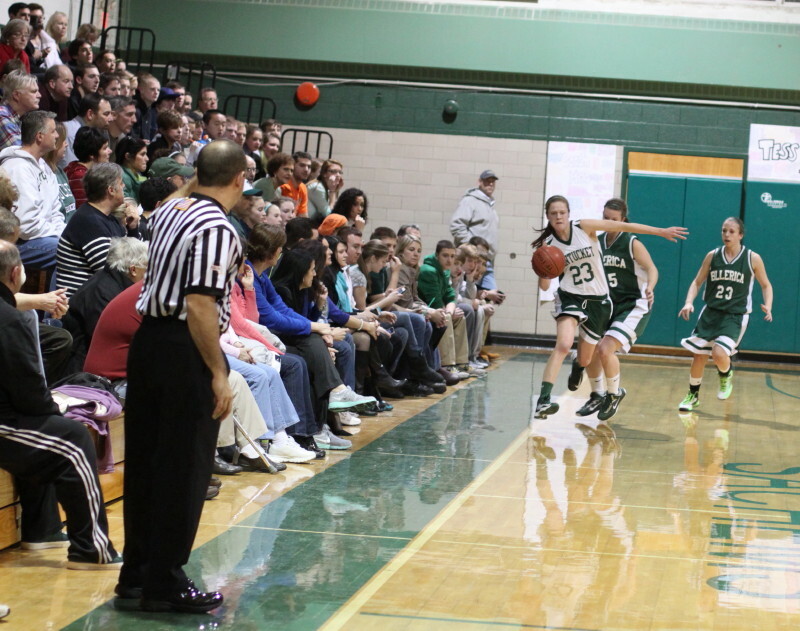 You started to think that this might be the night that the Tigers would take down Pentucket. But it didn’t happen. 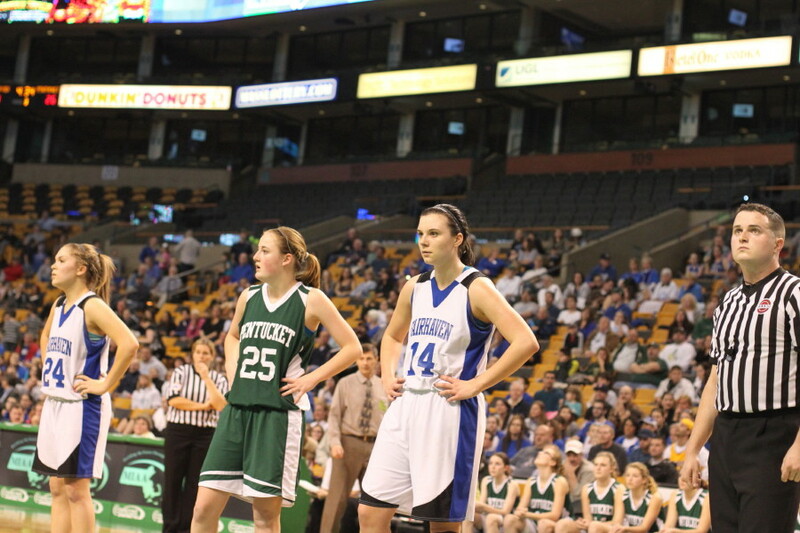 Coley Viselli (13 points) took over Kelsi’s point guard spot and Pentucket started taking the ball to the basket. There were some layups but more important to the final outcome, there were eighteen, second-half free throws. 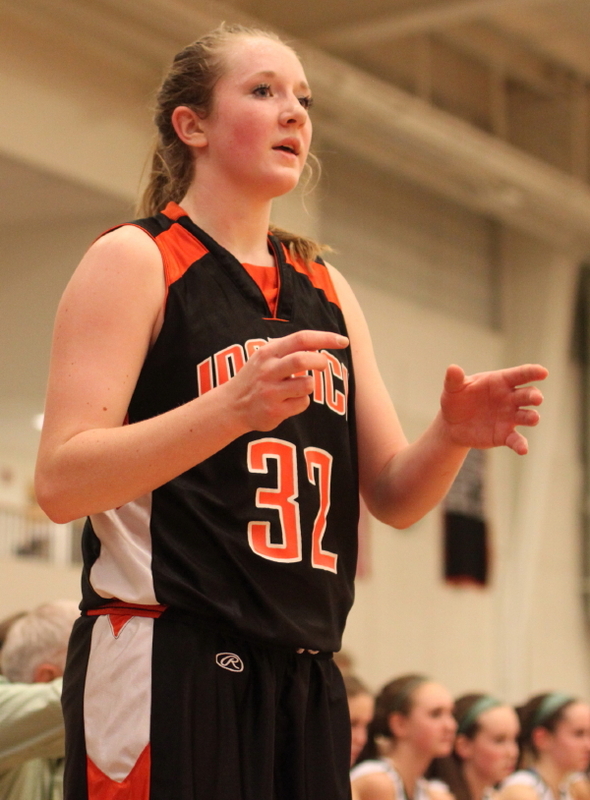 The Sachems were 16-of-18 from the charity stripe in the second half and that may well have been the difference maker. 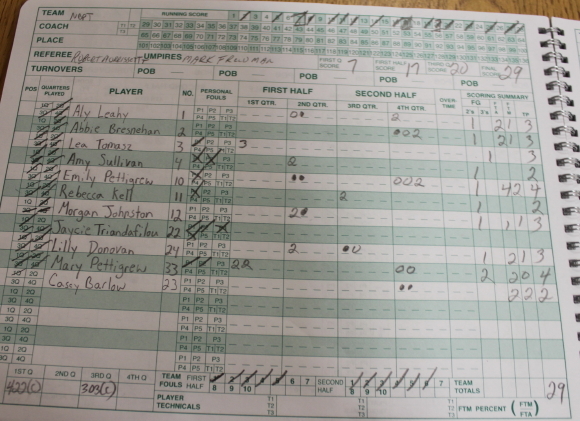 The Tigers were forced outside by outstanding defense and shot poorly and had only four free throws all game. 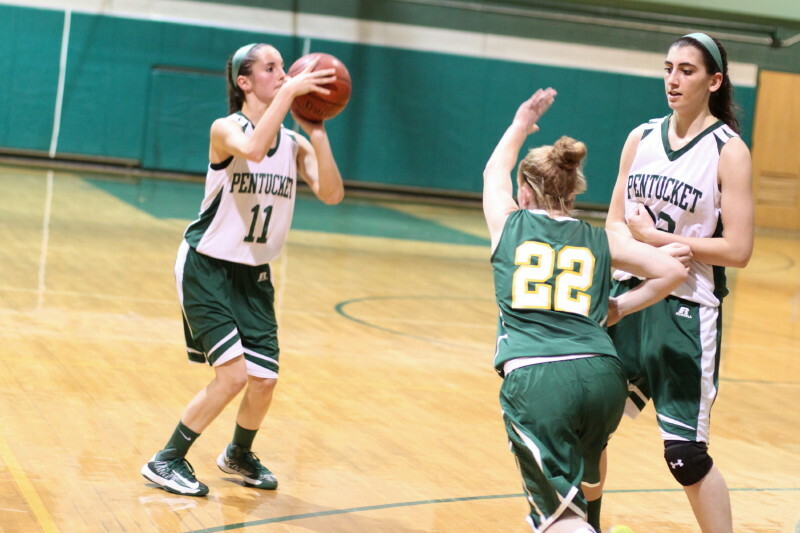 Kelsi McNamara went out early in the third quarter but came back later to start Pentucket on the 19-2 closing surge. 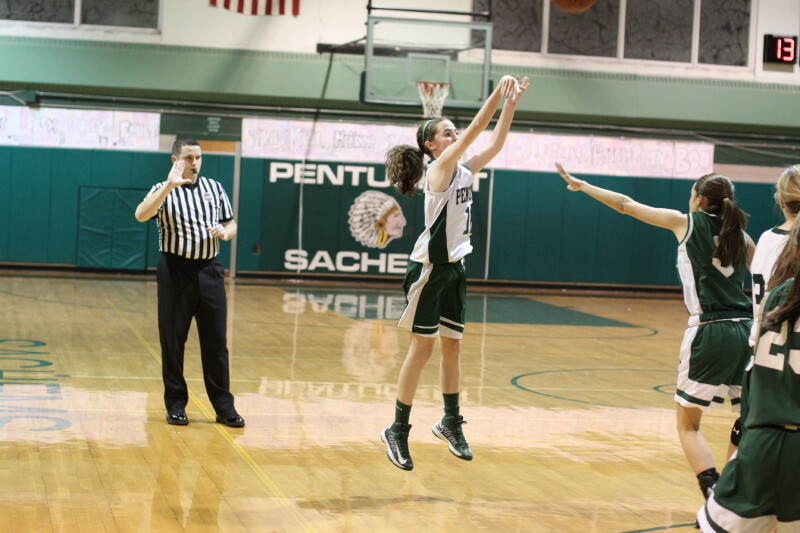 Kelsi had both of Pentucket’s three’s. 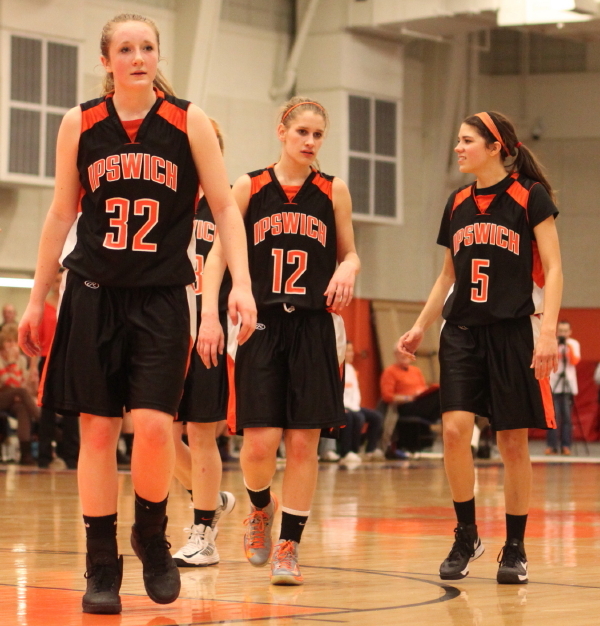 During the game, Ipswich struck from long range five times – Jenna Gagnon (2), Caroline Soucy (2), and Masey Zegarowski (1). 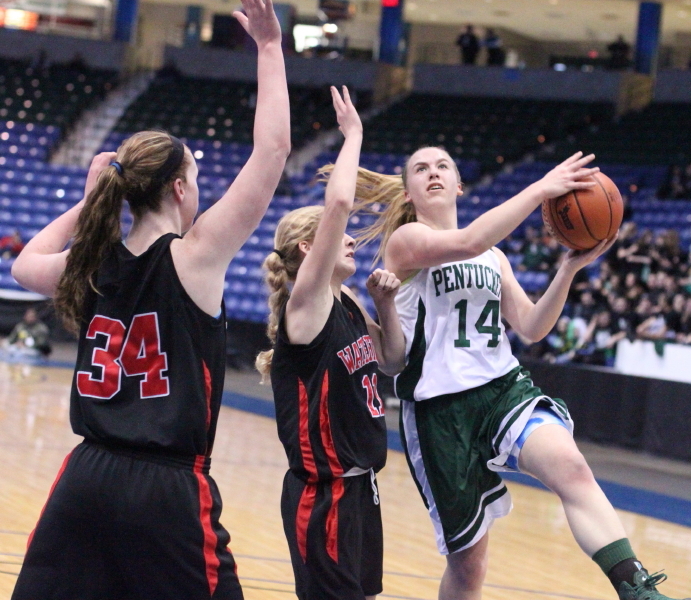 Alex Moore totaled nine points and McKenna Kilian eight points for Pentucket. 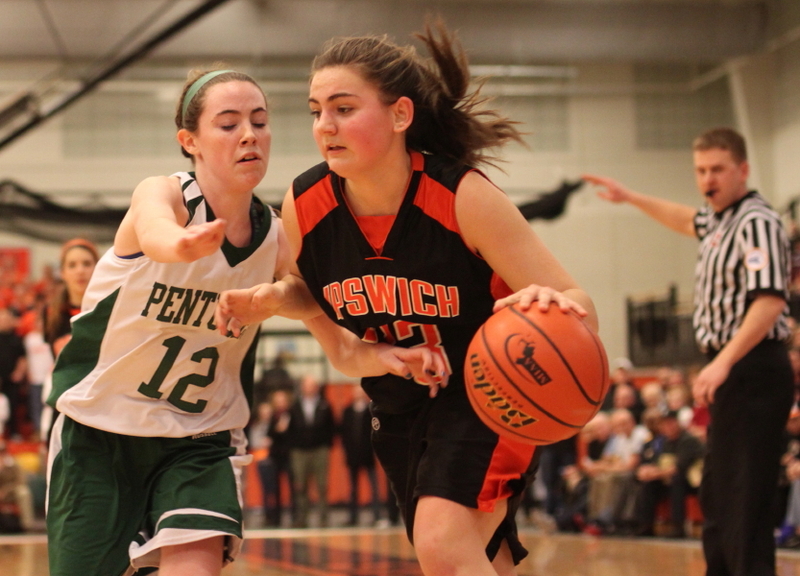 Sophomore Caroline Soucy paced Ipswich with eight points including two long ones. 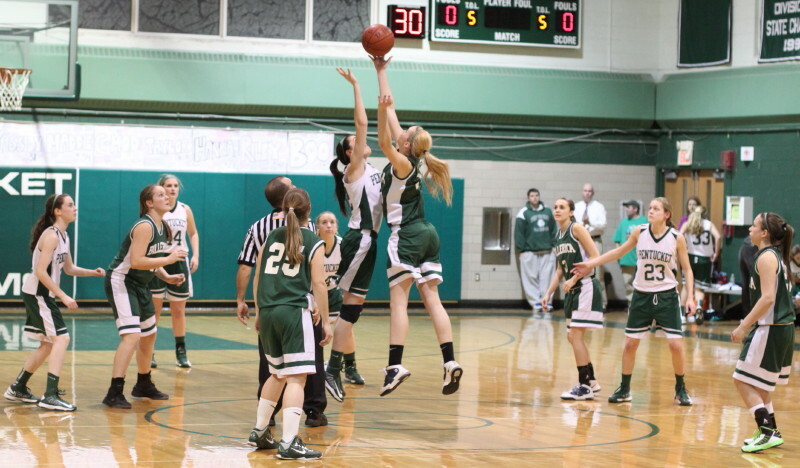 This was the second time that Ipswich has faced Pentucket in tournament action. 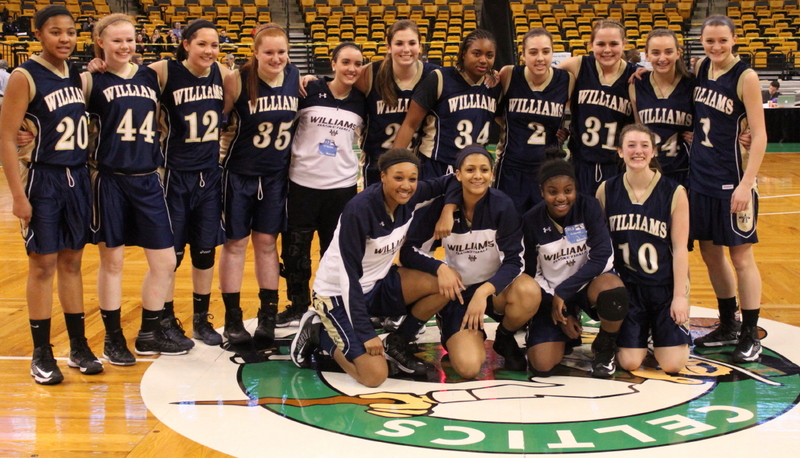 Last year it was in the North finals at the Tsongas Center. In that one, the Sachems ran twenty unanswered points in the second half and a 14-10 game turned into a 34-10 rout as Pentucket won, 49-30. The play of both teams was unusually bad in the first half. Why? May have been that both teams had to function on offense in front of the other team’s very active student section. 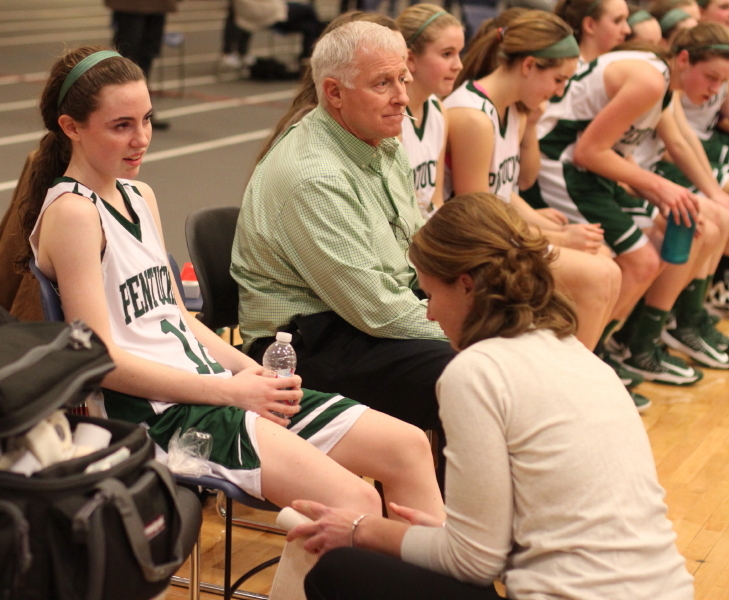 Pentucket played Saturday’s opponent (Watertown) at Pentucket in the First Round two years ago. 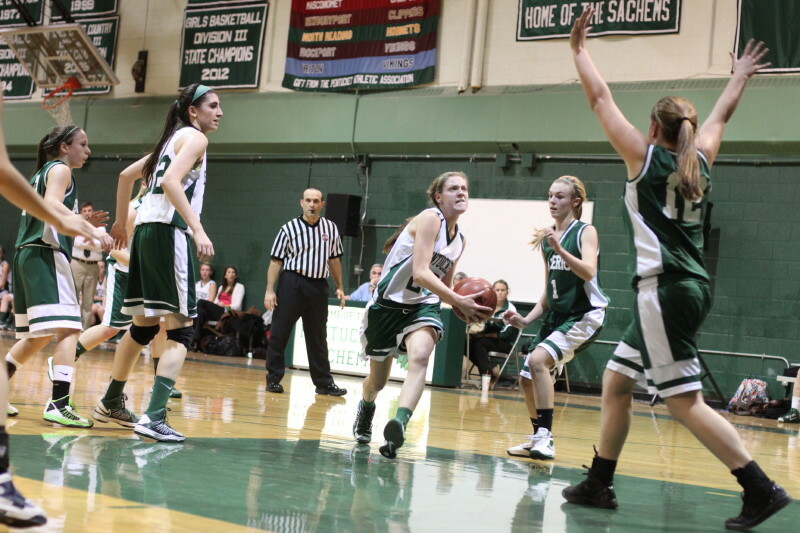 The Sachems overwhelmed the young Red Raiders, 52-22, on that occasion. Watertown was able to eliminate St. Mary’s (62-61) last night. St. Mary’s won the D3 state title two years ago. 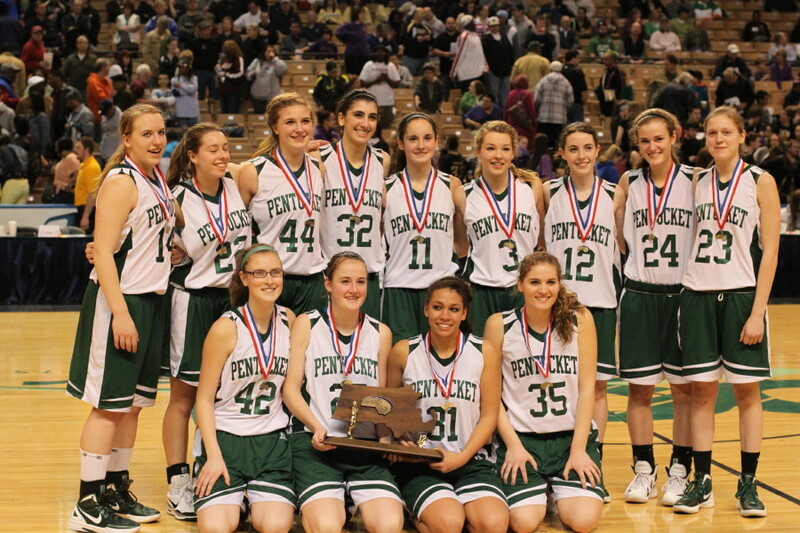 They eliminated Pentucket that year on the way to the championship. 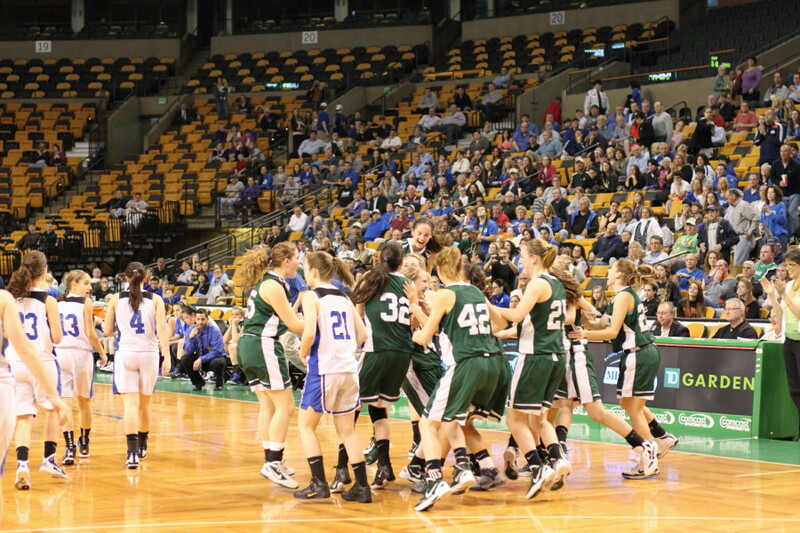 I am sure that no tears were shed in West Newbury when word came of St. Mary’s exit from this year’s tournament. 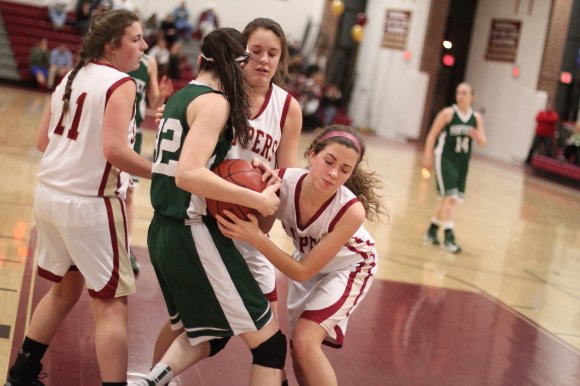 (Newburyport) Normally it’s the pressure defense that gets you when you face the Pentucket Sachems. Not so tonight. 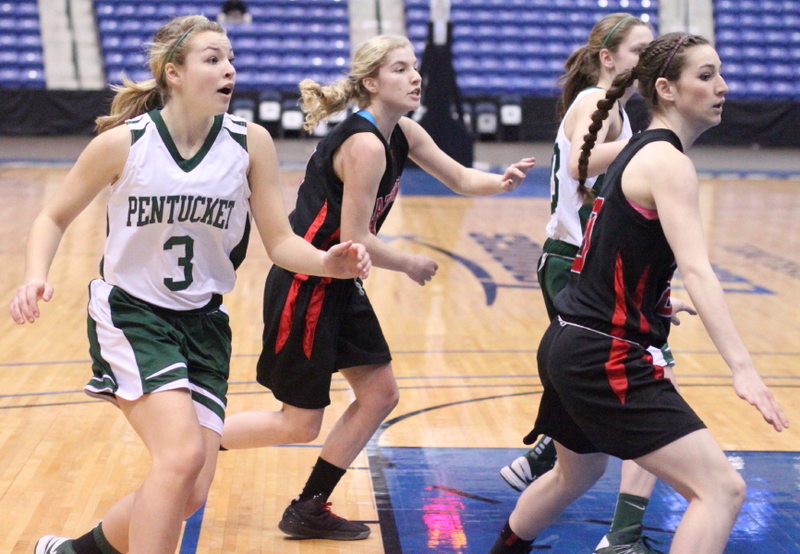 It was an on-fire Pentucket offense. 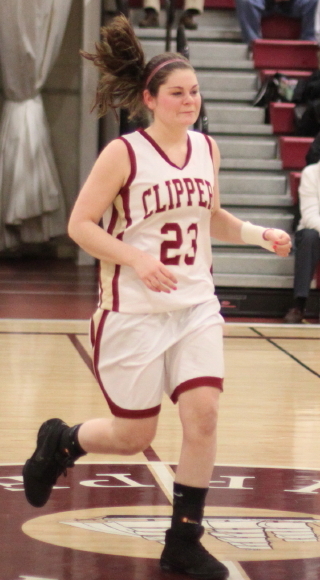 Newburyport (10-7) had no defensive answers and were defeated, 60-29, by the defending Division 3 state champs on Tuesday night in Cape Ann League action. 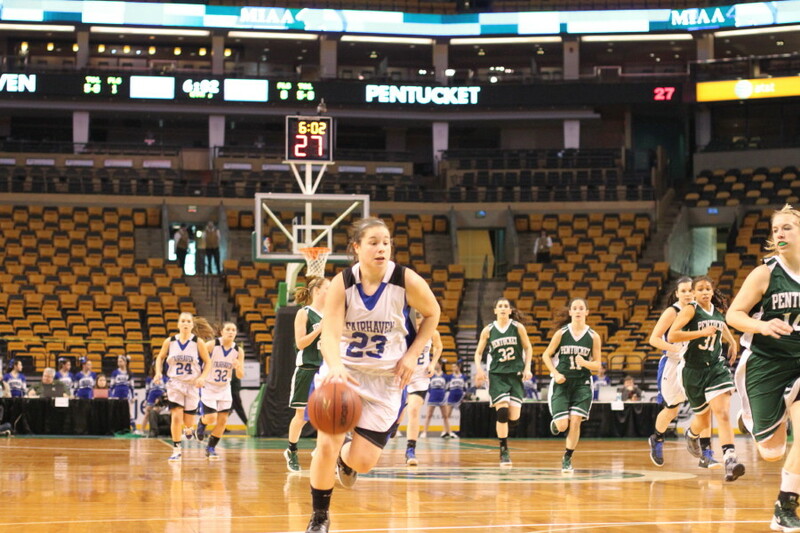 The girls from West Newbury took great care of the ball (three turnovers in the first half) and made shots from everywhere. 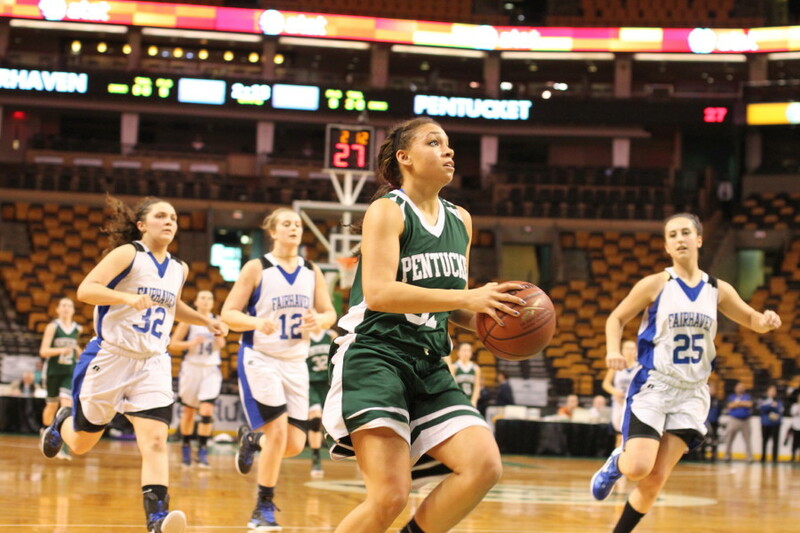 Pentucket (18-1) had the long ball going early. Four minutes into the first quarter three different Sachems (Alex Moore, Kelsi McNamara, and Coley Viselli) clicked from downtown. That barrage of 3-point offense helped put the Clippers behind, 13-2, and there was no recovery. The visitors closed the quarter with yet another three (Alex Moore) and two Tess Nogueira layups and the rout was on, 24-7, after one period. It was one of those games where no matter what defense NHS coach Greg Dollas tried ran into trouble. 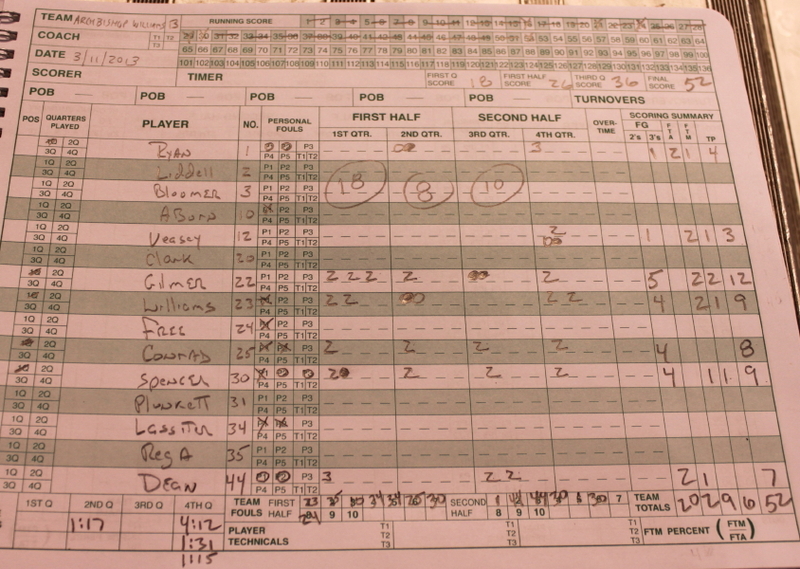 He used a zone and Pentucket made three’s. He played man-to-man and the Sachems blew past one-on-one defenders for easy layups. It was a defensive nightmare for the Clippers, plain and simple. 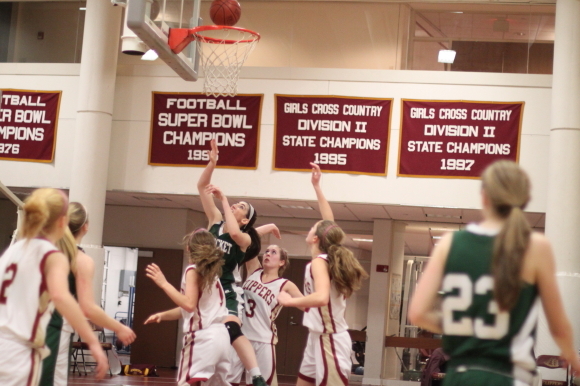 In the second quarter the 3’s were key in another Pentucket run of points. With the score, 28-10, after three minutes, the Sachems put a 10-2 package in place over the next four minutes. Three-pointers by Alex and Coley as well as layups by Coley and McKenna Kilian provided the points. 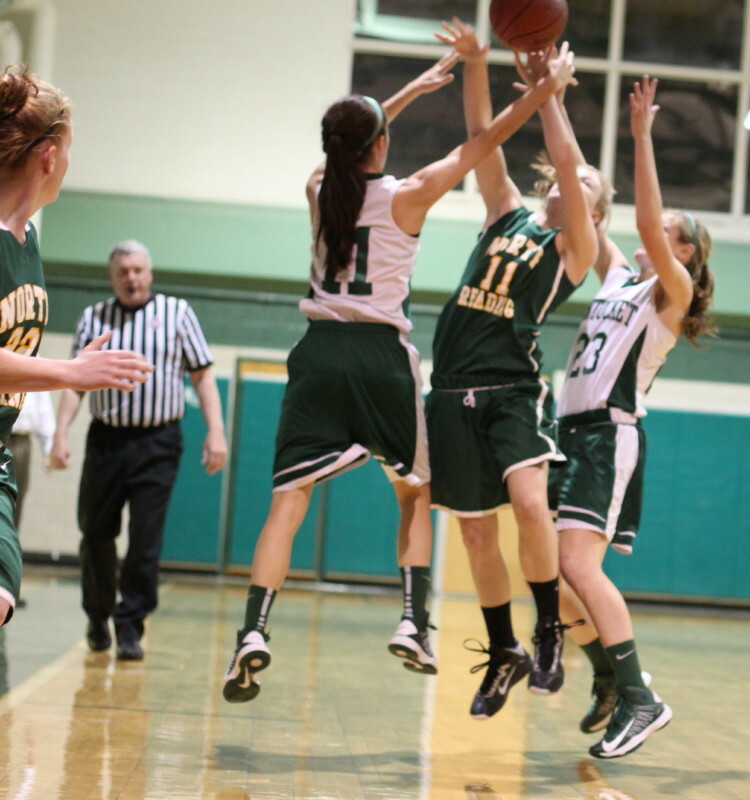 The Sachem advantage was extended to, 38-12, in the process, with a minute left. 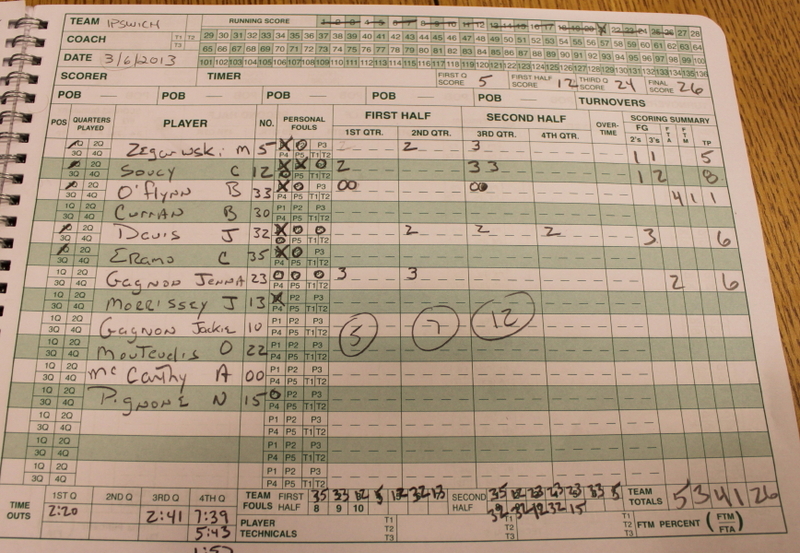 The rest of the game was played mostly by reserves on both teams. 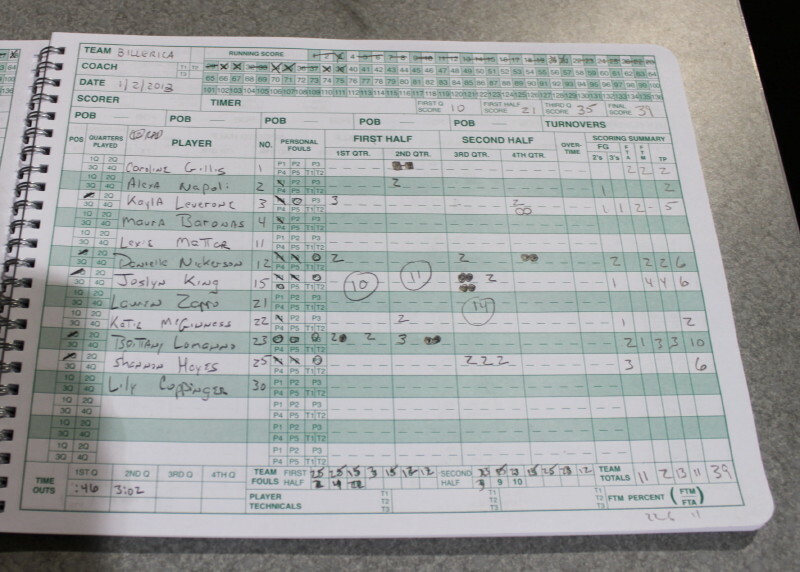 Pentucket only had a 22-16 edge during the rest of the game but that was probably little consolation to anyone connected to the Newburyport program. 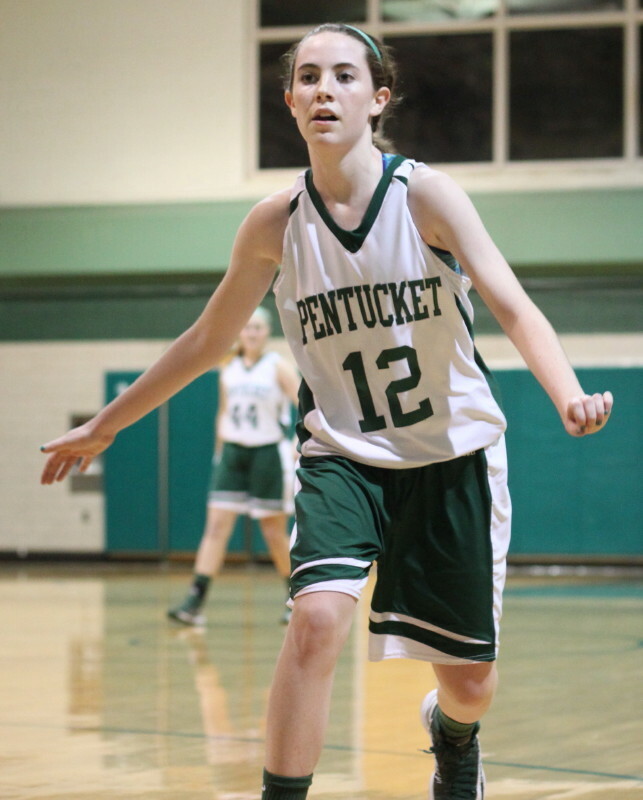 All of the Pentucket starters reached double figures in limited minutes: Kelsi McNamara (12), Alex Moore (11), Tess Nogueira (10), Coley Viselli (10), and McKenna Kilian (10). 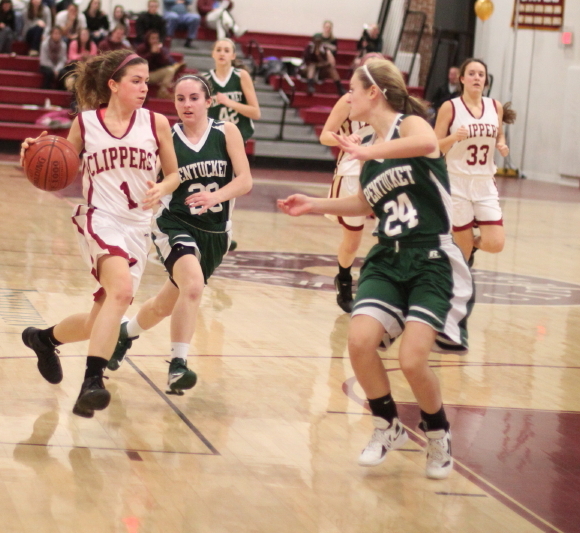 Newburyport had ten girls score with the Pettigrew sisters (Mary and Emily) leading the way with four points each. 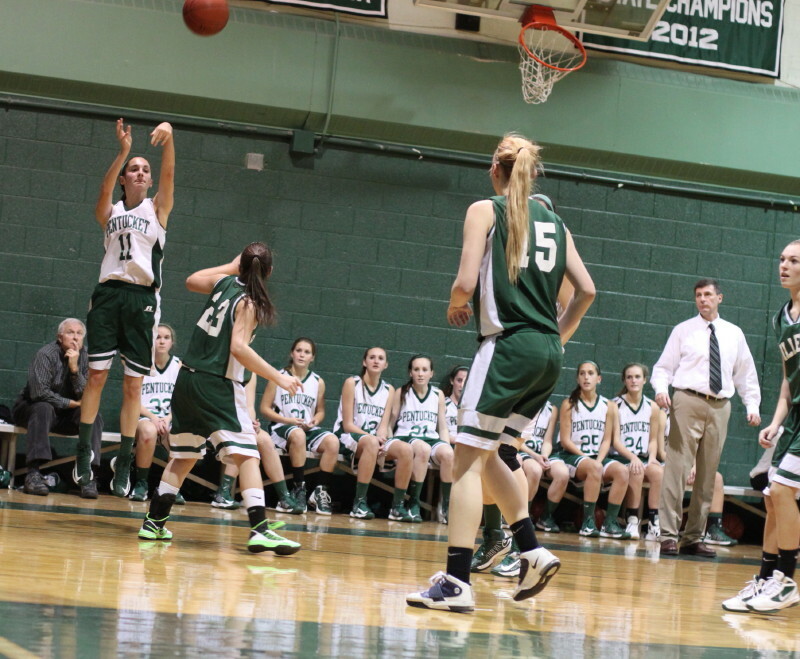 The Sachems connected on nine three-pointers. Reserve Kassidy Kennefick nailed two in the 4th quarter. 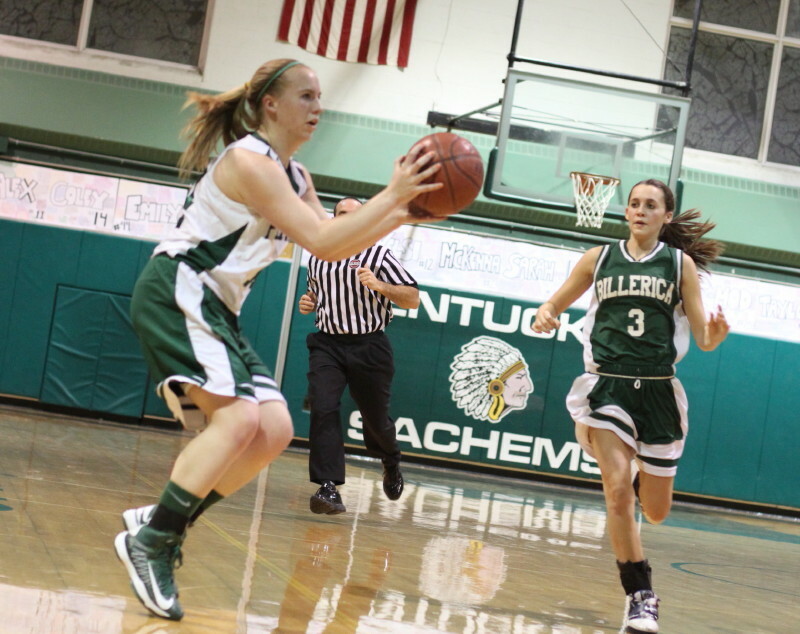 In the previous meeting between the two teams on January 4th at West Newbury, the Sachems rode Kelsi McNamara’s four 3’s to a, 61-33, win. Newburyport, which has qualified for the state tournament, finishes its regular season on Thursday against Masconomet at Masconomet. Pentucket will be hosting Hamilton-Wenham on the same night in what should be an emotional Seniors Day for the Sachems. Key pieces in the Pentucket success over the past few seasons (Alex Moore, Tess Nogueira, Coley Viselli, and Emily Dresser) will be honored. Newburyport recognized its seniors tonight – Lea Tomasz, Rebecca Kell, and Casey Barlow. Casey had her left hand wrapped but that didn’t stop the usual lefthander from making two free throws with her right hand. 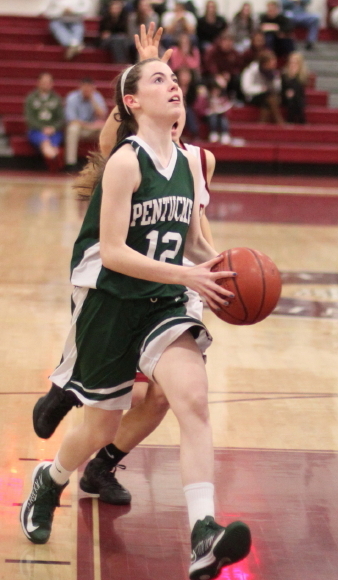 (West Newbury) Pentucket hit eight 3’s and scored the game’s last eleven points as they defeated Billerica, 59-39, in a nonleague contest on Wednesday night. 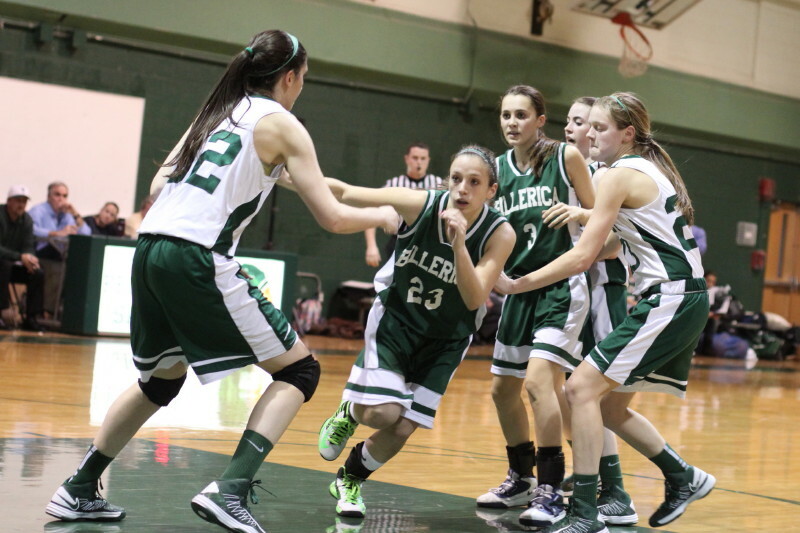 A little over a year ago Billerica, at their place, had a strong second half and routed the Sachems, 63-43. But this time around undefeated Pentucket (6-0) made shots from long range (eight over the first three quarters) and shut out the Indians (4-1) over the last 4:25 of the game. That combo did in the Division One opponent from the Merrimack Valley League. 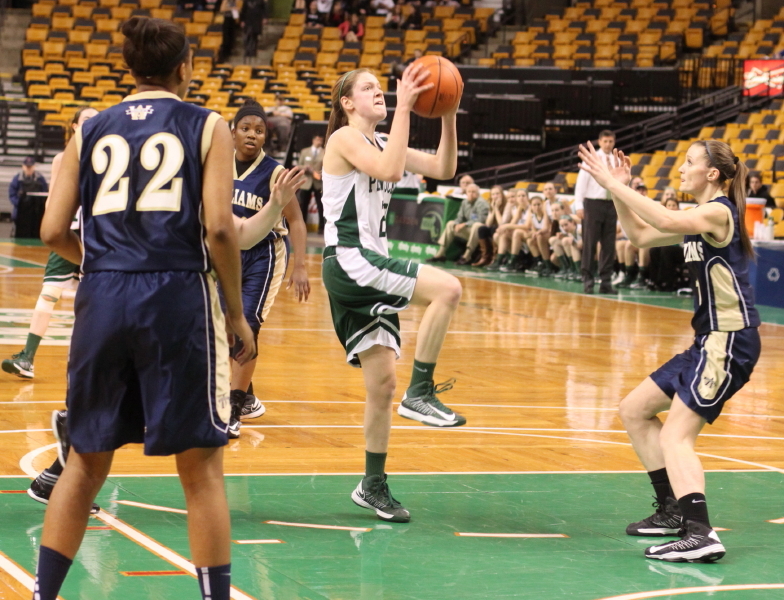 Pentucket took the lead for good midway through the first quarter (7-6) on a three by Kelsi McNamara (15 points). That lead would get to nine (17-8) before the Indians ran seven straight into the second quarter. 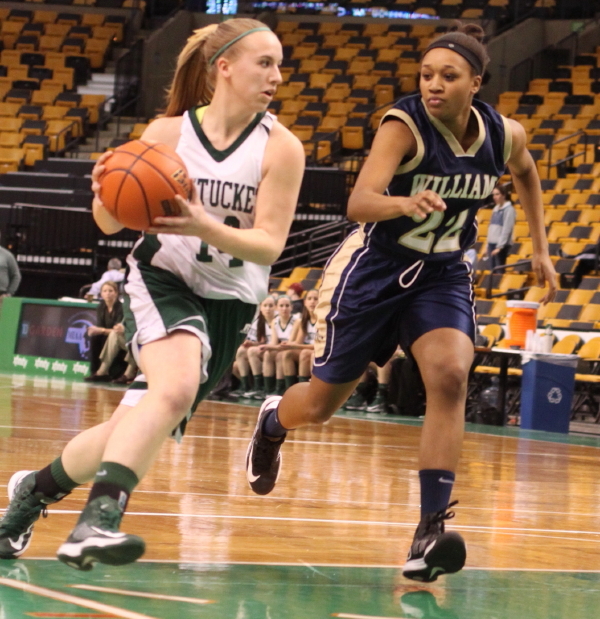 Brittany Lomanno (10 points) had Billerica’s only three as the Indians moved to within two (17-15) 1 ½ minutes into the second quarter. Pentucket would get that lead up to eight (29-21) as Coley Viselli (9 points) ended the half with a three and two free throws. 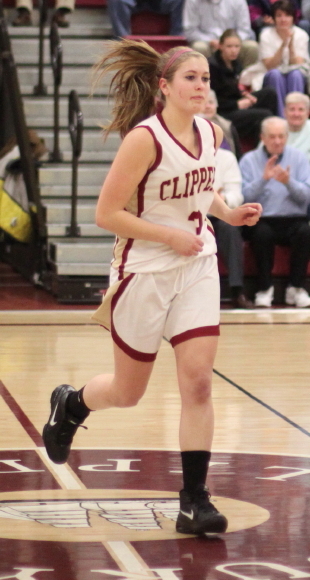 Kelsi McNamara dropped three 3’s in the first 2 ½ minutes of the second half to offset a strong third quarter by junior Shannon Hayes (eight points in the quarter). Pentucket led, 46-35, after three quarters. The final quarter started out harmlessly enough – full court drive by Kayla Leverone, two free throws by Alex Moore, and two free throws by Danielle Nickerson. 48-39 with 4:25 left. The rest of the way? All Pentucket. 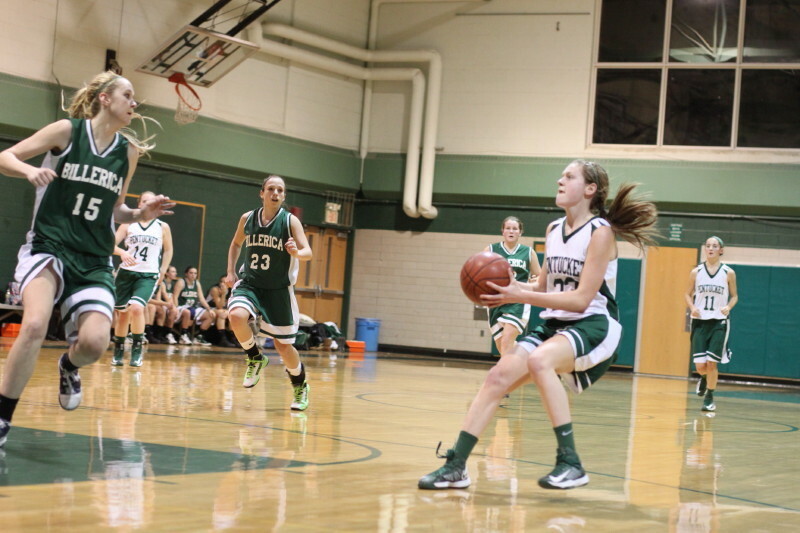 McKenna Kilian (13 points) sparked the Sachems. 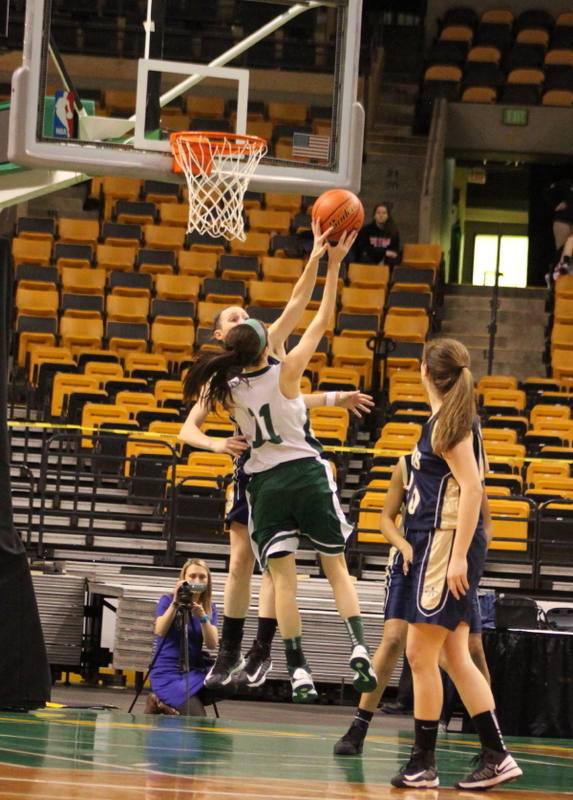 The speedy sophomore started things with a block of Brittany Lomanno’s layup attempt. Later she added a couple of full-speed, stop-on-a-dime jumpers, two free throws, and a last-second toss off the backboard. 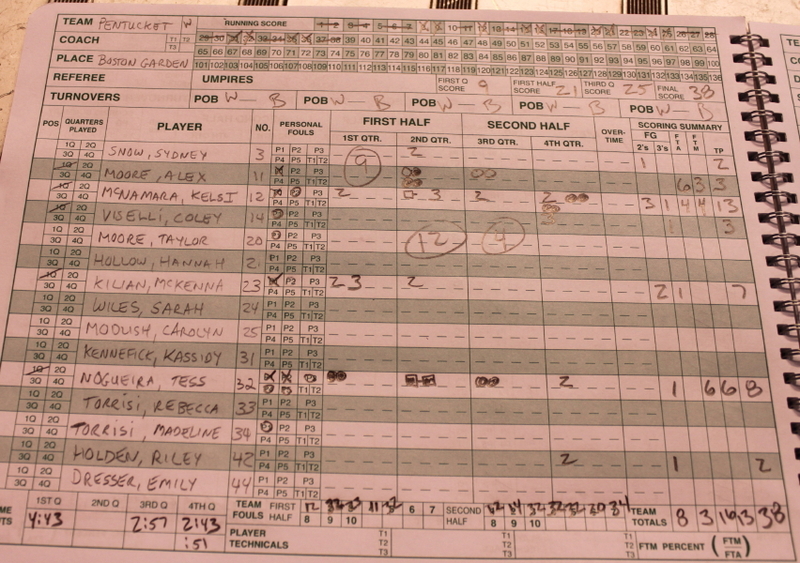 Pentucket had four three’s in the first quarter, one in the second, and three in the third. Normal starter Alex Moore (8 points) came off the bench late in the first quarter and promptly drained two 3’s in thirty seconds. Billerica coach Chris Doneski surprised me plenty by going to a zone defense after Pentucket had four 3’s in the first quarter. But it actually worked in the second quarter. The third quarter? Not so much! Blame Kelsi McNamara. The sophomore found three openings around the top of the key and connected on all of them. Back to the man-to-man went the Indians. Playing that defense and facing full-court pressure all game long may have been the culprits in the Indians disastrous last 4 ½ minutes. 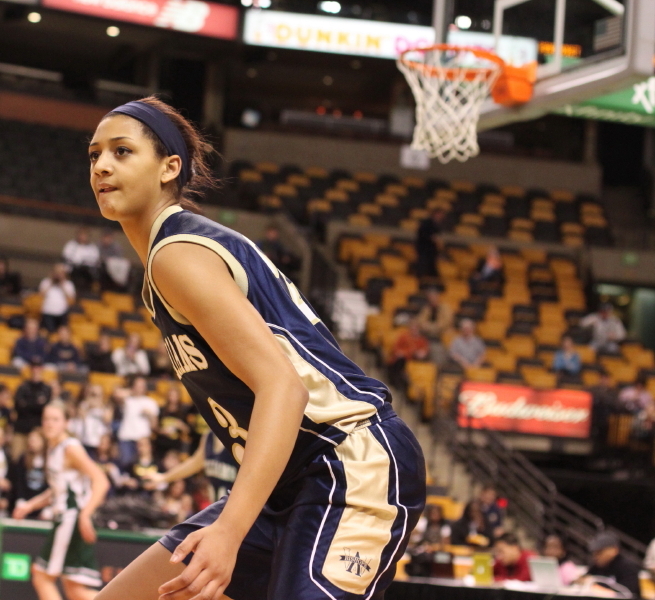 Tess Nogueira (12 points) had the best game I’ve seen her play. 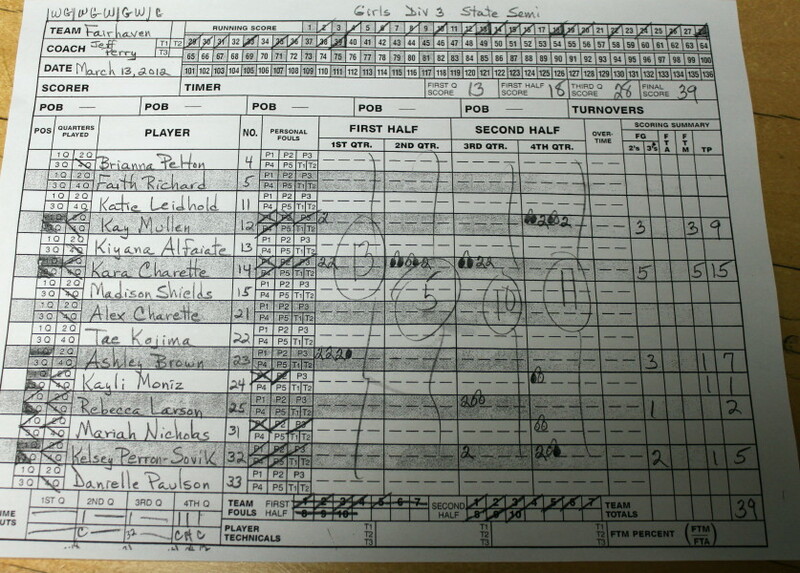 She faced a taller defender (Joslyn King – 6’1”) and was able to score points and get Joslyn (6 points) into foul trouble. Two memorable Tess moments were a flip-back as she went under the basket and a full-court drive in the last two minutes. 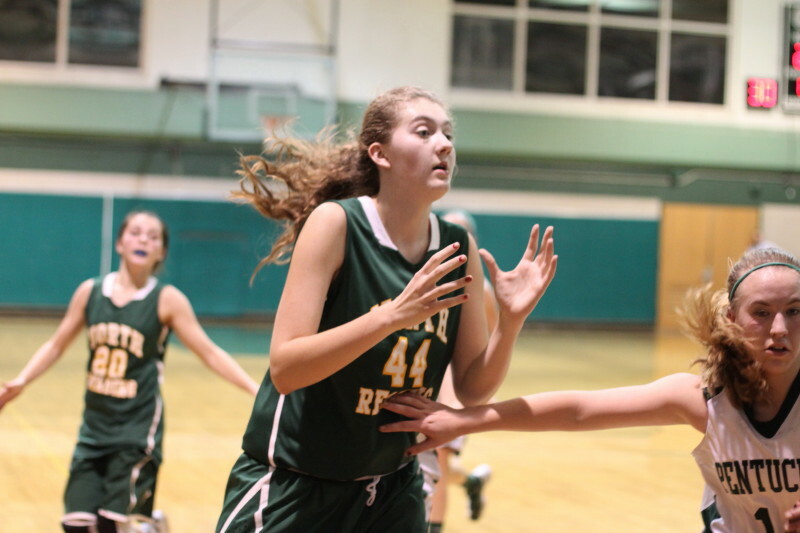 On that drive I’m certain she was planning on giving the ball up but no one from Billerica stepped up to stop the senior and she kept on going. It is hard not to be impressed with Division Three Pentucket being able to defeat a quality D1 opponent. 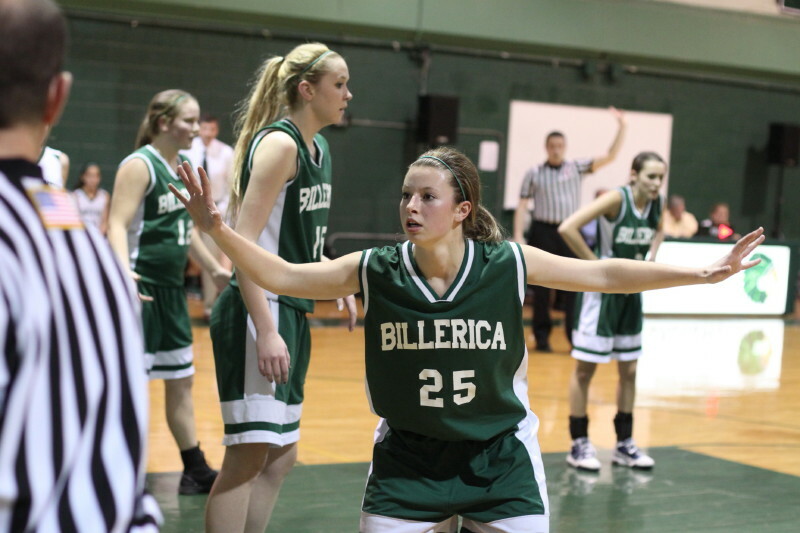 Billerica was 17-4 last season. I saw them lose to D1 undefeated state champ Andover (with Nicole Boudreau) by a point at Andover. The Indians missed four free throws in the last 1 ½ minutes in that tough loss. 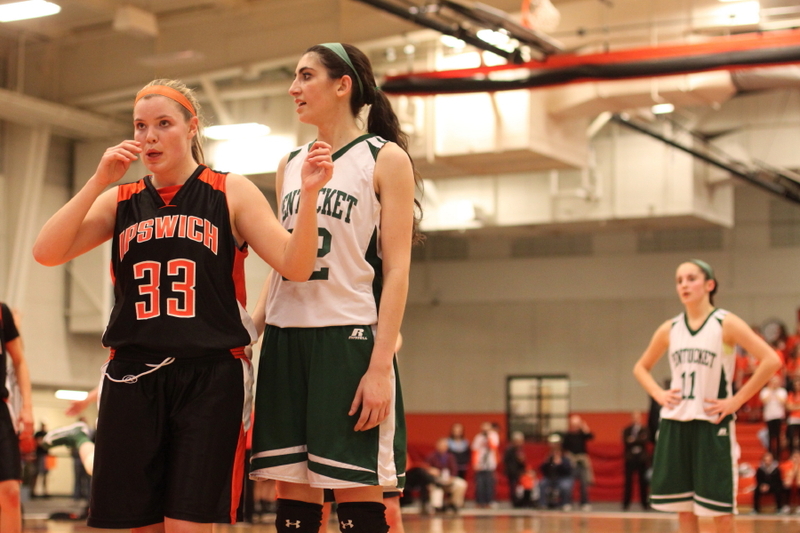 The pace of this game was certainly to the Sachems liking. 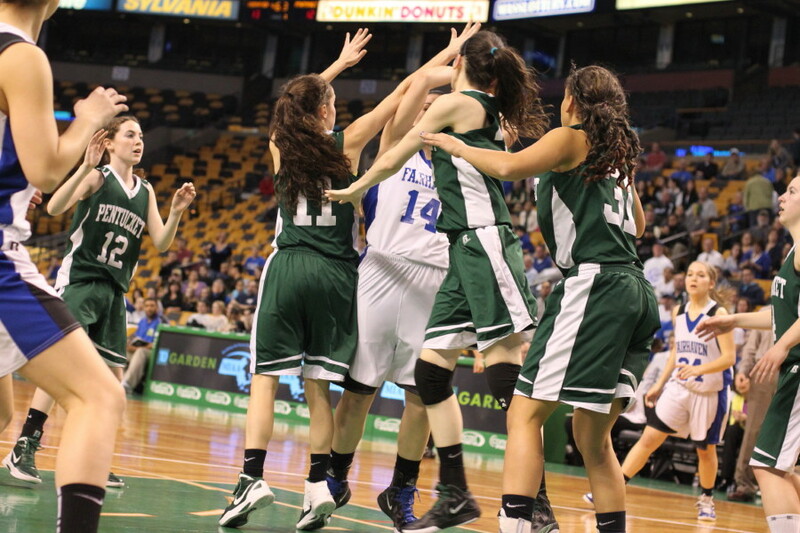 They forced the ball away from Billerica’s primary ball-handlers much of the game and made passing difficult. Credit the Indians for being able to handle the pressure in the backcourt. The struggle was in the front court. 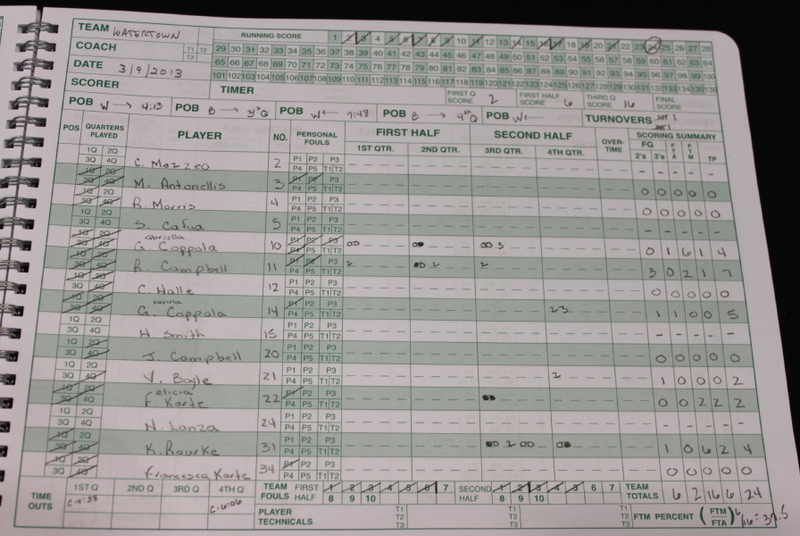 Billerica had twenty-one turnovers (by my unofficial count) and missed a ton of rushed shots. You win by twenty you probably will overlook your own team’s eighteen turnovers. 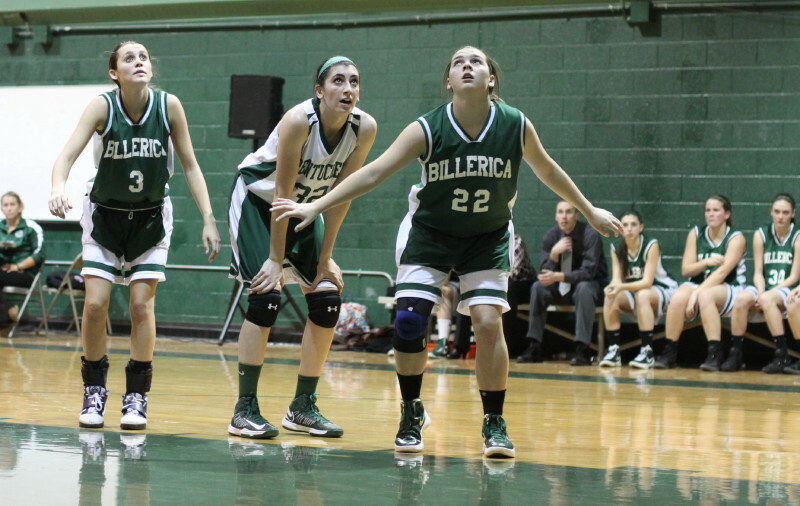 Billerica’s athleticism forced that many and showed well in the one-on-one matchups when the pace was to their liking. 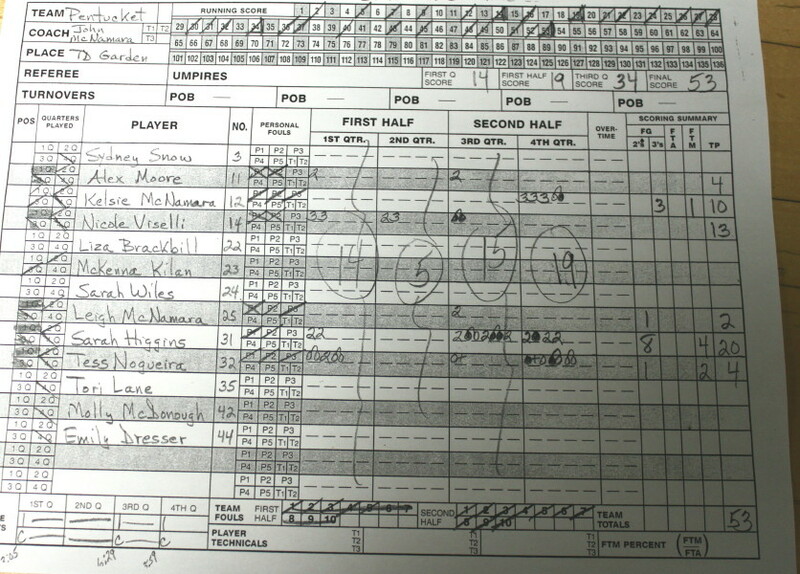 However, Pentucket was able to speed things up most of the night and get enough openings to dominate from long range. 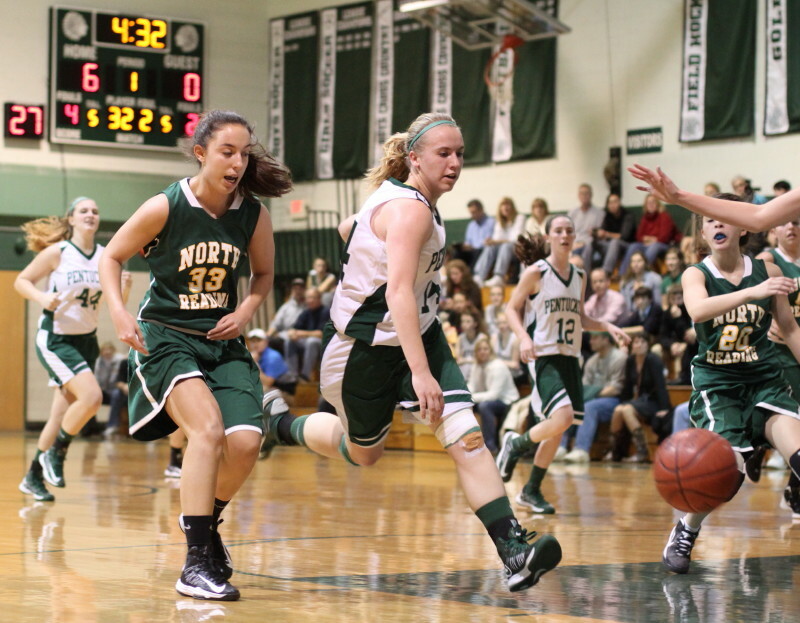 Billerica will next be hosting a very tough North Andover team at home on Friday night. Pentucket will be hosting Cape Ann League opponent Newburyport also on Friday night. ESPN Boston was in the house. So was Masco’s Bob Romeo. The state championship banner has now found a spot on the gymnasium wall. 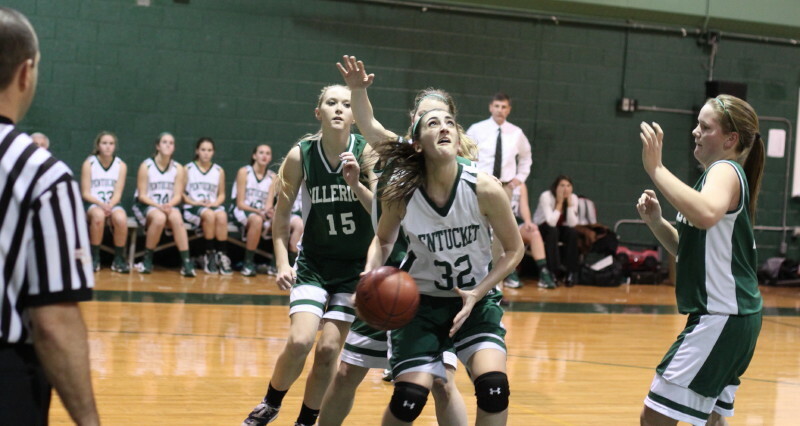 (West Newbury) The Pentucket girls struggled mightily in the first half but returned to last year’s form in the second half as they defeated North Reading, 57-35, in Cape Ann League action on Tuesday night. The “first half Sachems” could well have been thrown off by the festivities before the game. 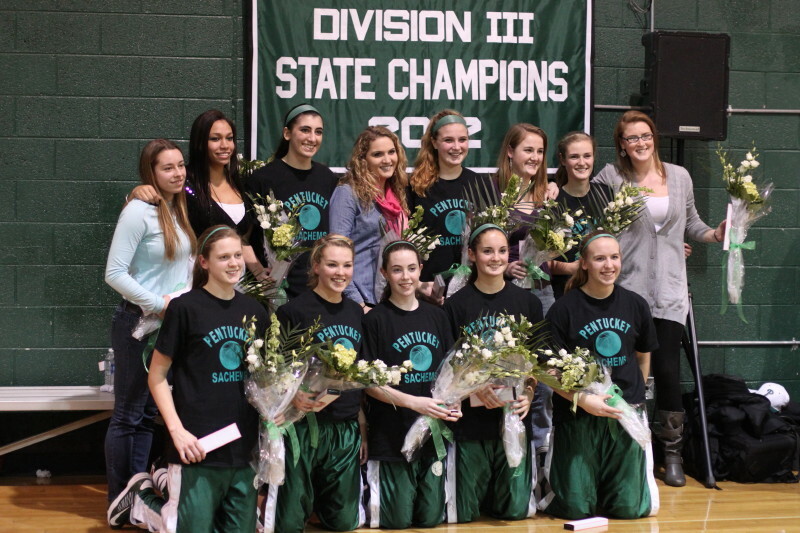 The 2011-12 Division 3 state championship banner was unveiled and the thirteen team members from that 23-4 squad were reunited one last time before an adoring home crowd. This was my first look at the team since the March 17th win over Sabis (55-32) at the DCU Center in Worcester as they captured the D3 title. 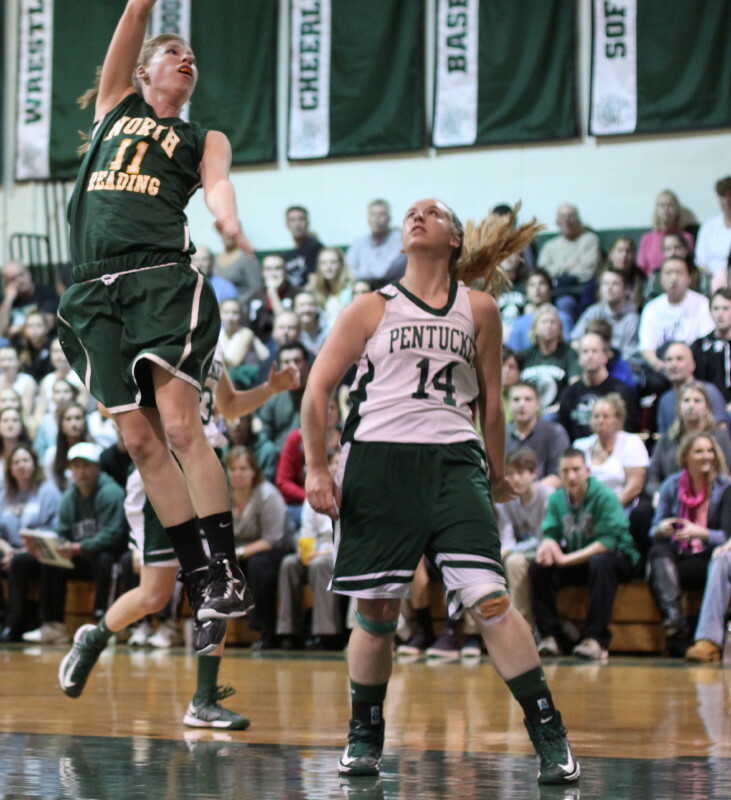 Leading the way for Pentucket on that memorable afternoon were Sarah Higgins with 22 points and Kelsi McNamara with three long ones. 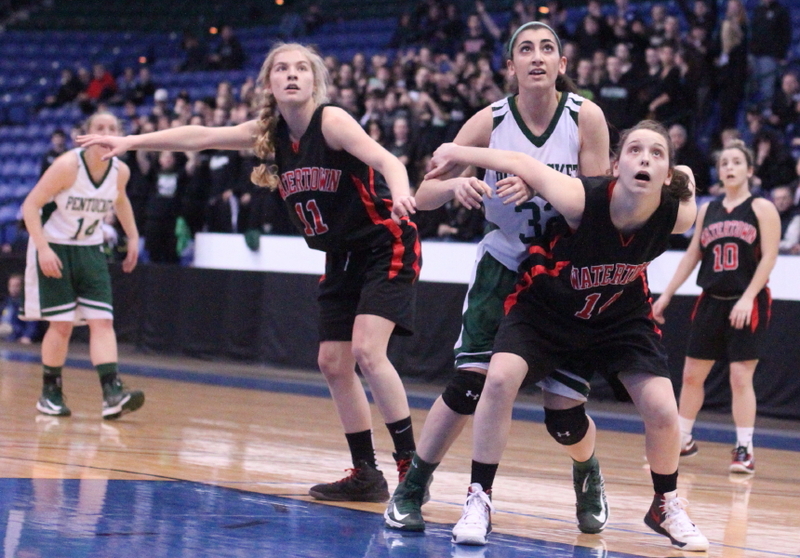 But the 2012-13 Sachems (2-0) were struggling. There wasn’t a shot near or far that they could make consistently. And there were plenty of turnovers. In the second half, a crucial ingredient in years of success returned……….shooting, and when that happened in the third quarter, the 2012-13 team started giving a great impression of the championship team of the previous season. North Reading (0-2) actually got within two points (21-19) a minute into the second half but then the Pentucket scorers started hitting shots from everywhere, especially long range. With shots falling, the Sachem defense could setup and pressure North Reading into a pace that created turnovers and rushed shots. 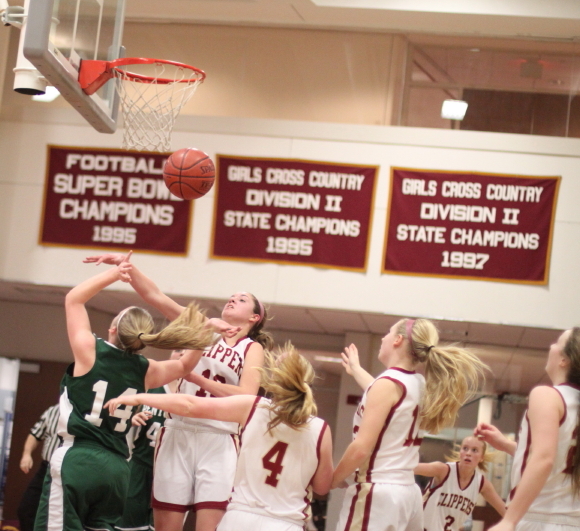 The visiting Hornets would make just one basket (Tarah Reilly) over the next six minutes while the Sachems put up twenty-one points and blew this one wide open, 42-21, with a minute left in the third quarter. 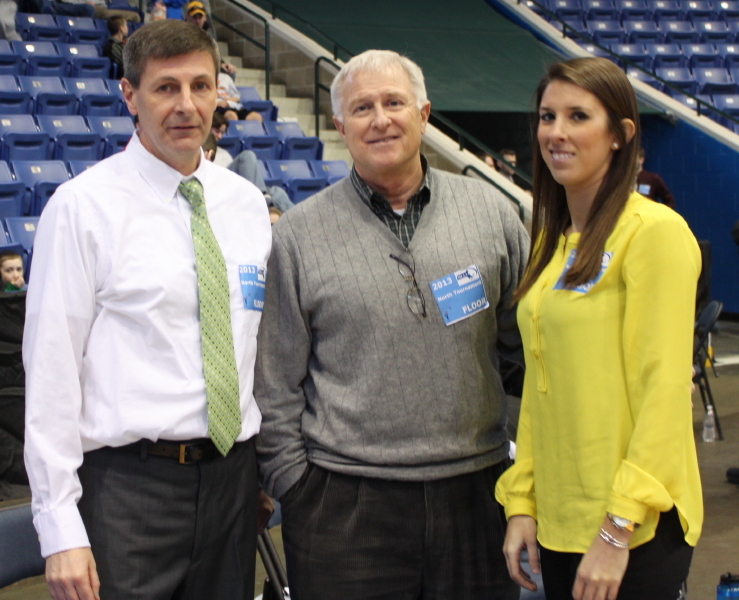 Two treys by Alex Moore and one each from Coley Viselli and Kelsi McNamara highlighted the surge. 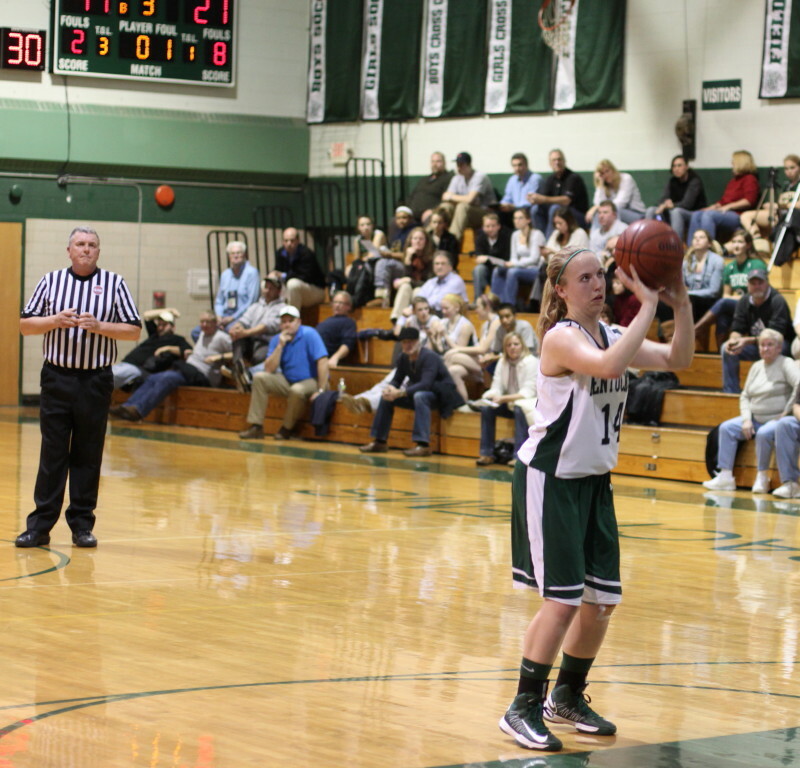 The Sachems also added 7-of-8 free throws and a floater in the lane from McKenna Kilian. 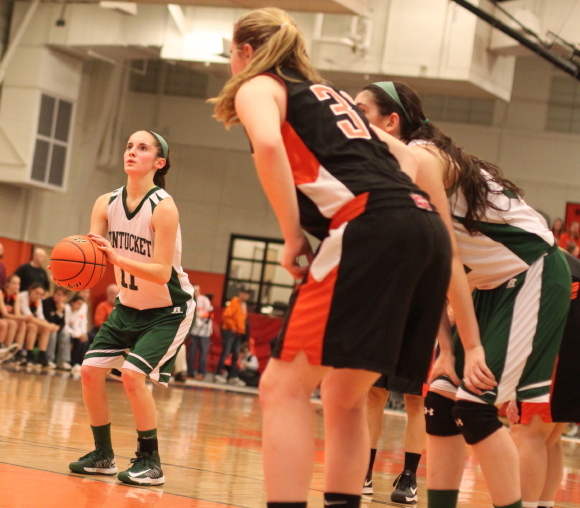 That burst of positive production separated the two teams and North Reading was unable to get within double-figures of the Sachems the rest of the way. Not only was the championship banner unveiled but the home fans also got a look at seven new players including five freshmen. 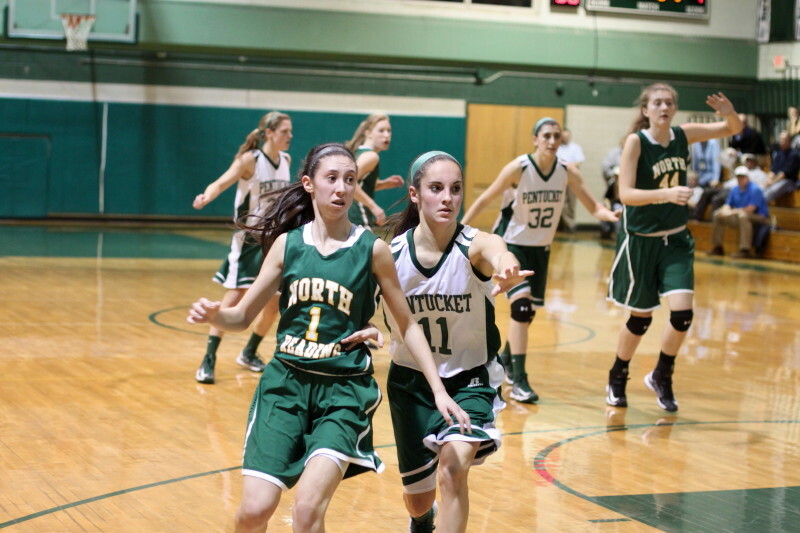 Sophomores McKenna Kilian (14) and Kelsi McNamara (13) paced Pentucket. Senior Alex Moore added eleven points. The Sachems next game is Friday night at Triton. 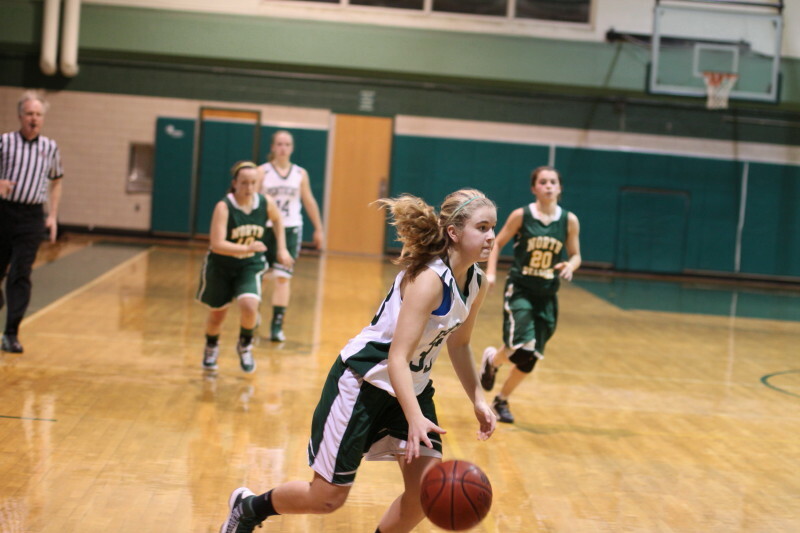 Freshman Carly Swartz (11) led the Hornets. 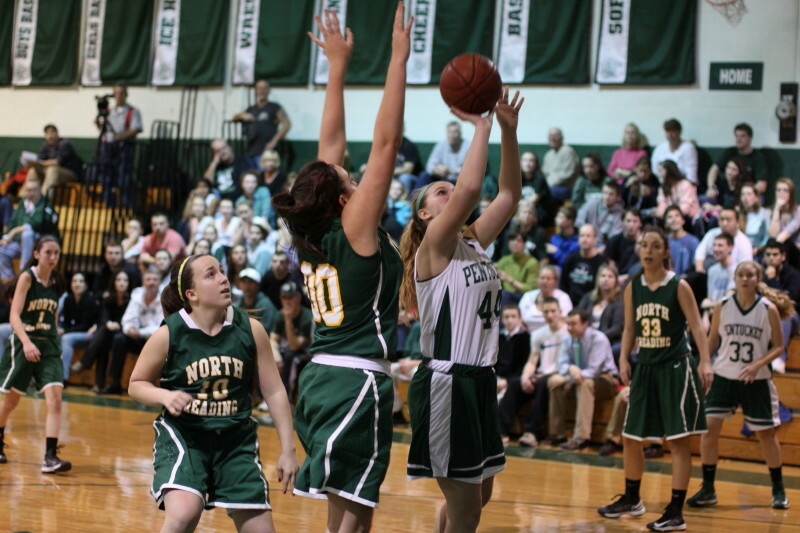 Carly scored all eleven in a first half in which North Reading made things very interesting for Pentucket. 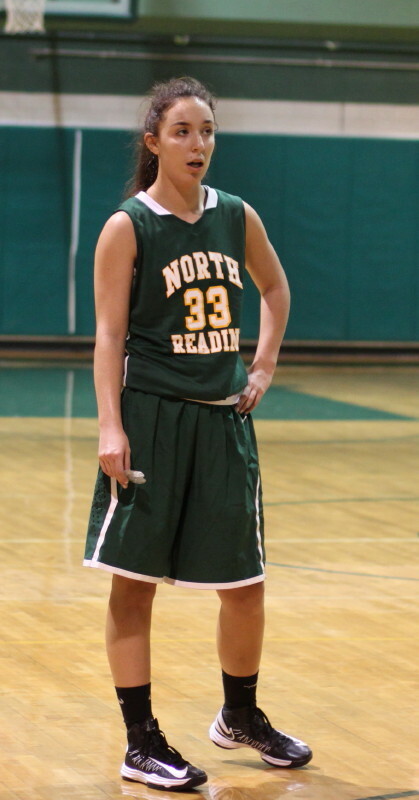 6-5 freshman Jessica Lezon was a defensive presence for NR. The Hornets will look for their first win at Masconomet on Friday night. Quietly in the background during the pre-game celebrations was Pentucket coach John McNamara. 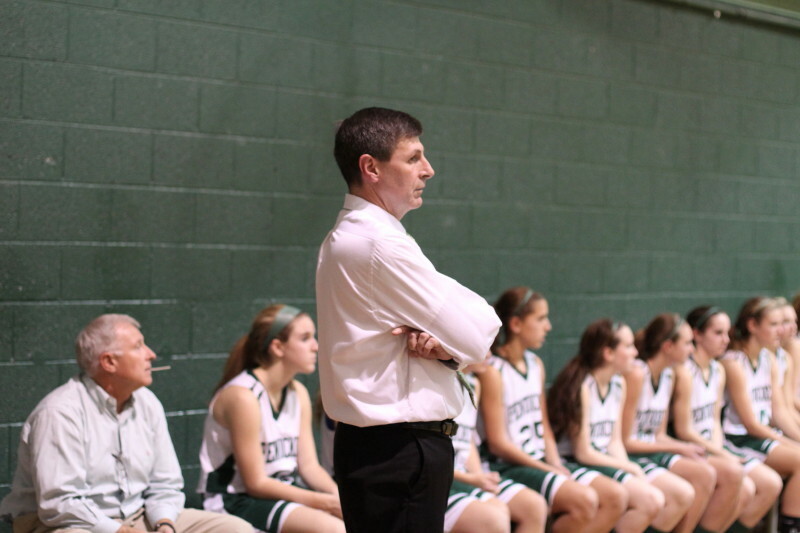 His 136-18 record at Pentucket, and counting, is truly remarkable. A look ahead at the Pentucket schedule has them starting off with Division 1 Billerica in January in a non-league game. 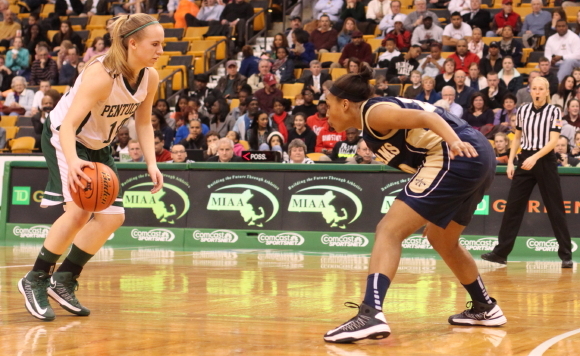 Last season I saw Billerica nearly defeat Nicole Boudreau and the Andover Golden Eagles at Andover. Their key players were underclassmen. The Pentucket/Billerica contest is at Pentucket and should be special. 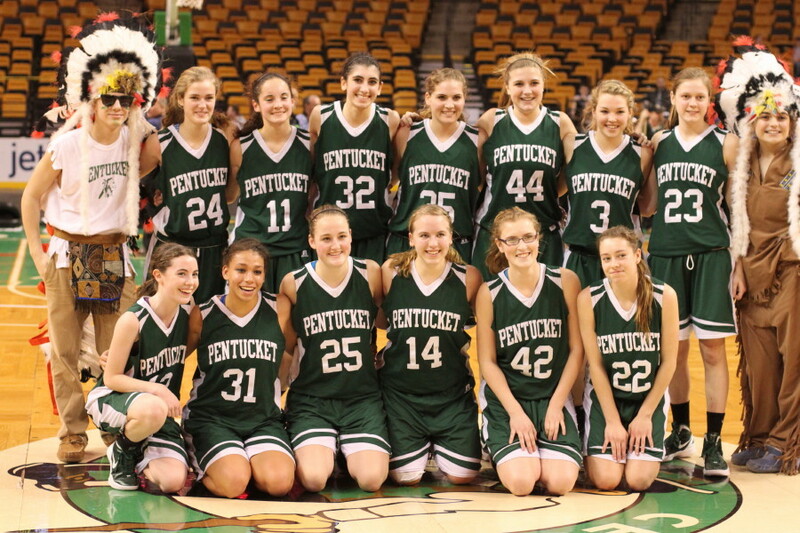 (Boston) Pentucket (22-4) secured passage to the state D3 finals on Saturday in Worcester with a solid second half as they defeated Fairhaven (22-3), 53-39, on Tuesday at the TD Bank Garden. Each team tallied just five points in a second period that may well have been impacted by a serious injury to Fairhaven starter Ashley Brown in the first quarter. Ashley dove out-of-bounds for a loose ball and collided with the edge of the scorer’s table. Considerable time was rightly spent by the numerous medical people on hand to take care of Ashley. She was taken to Mass General. 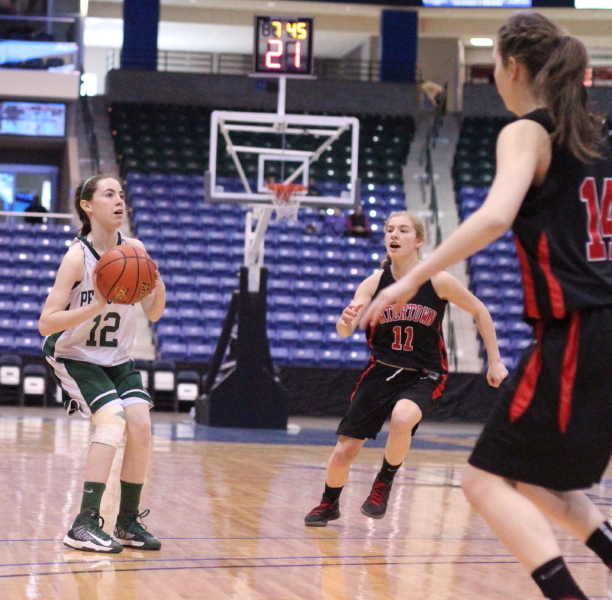 The Sachems had a 19-18 lead after the sluggish second period and I had no sense of how the second half would go. As it turned out, for Pentucket it went very well. 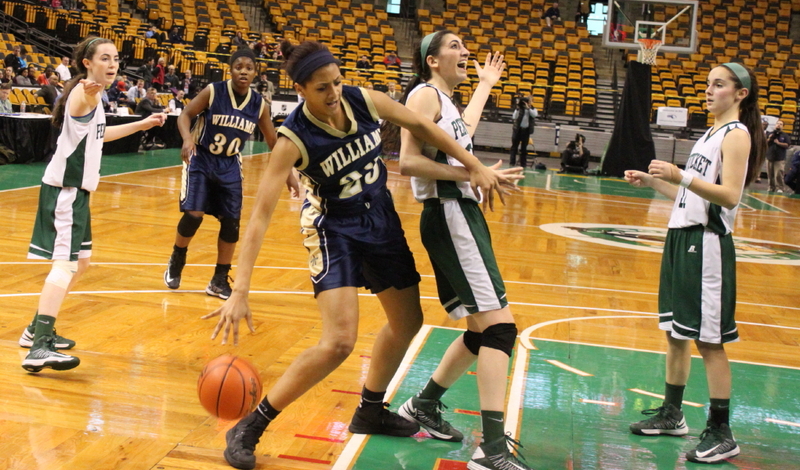 Their defense produced turnovers (six in the 3rd period) and Sarah Higgins (20 points) hit from the outside, inside, and from the foul line. The Sachems actually took the lead for good (26-24 on a full-court Sarah drive at 4:54) with the advantage being 34-28 heading into the final quarter. 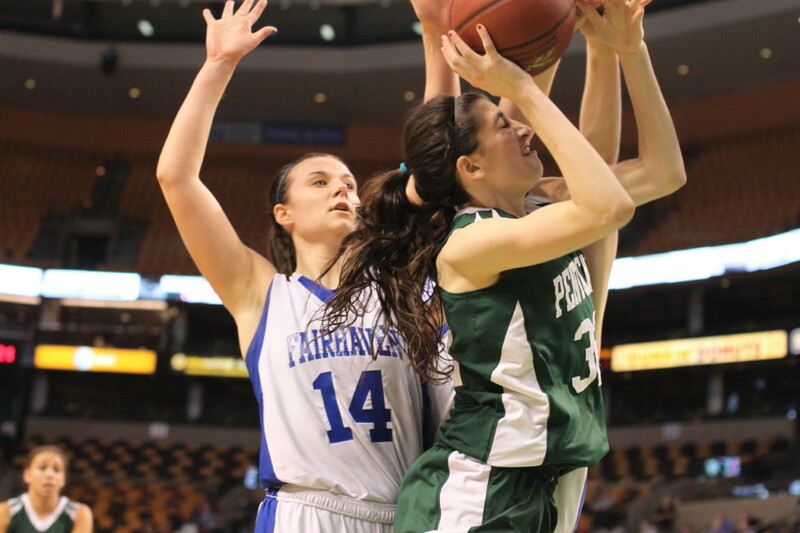 Kelsi McNamara destroyed any Fairhaven thoughts of a last-quarter rally with three long ones. 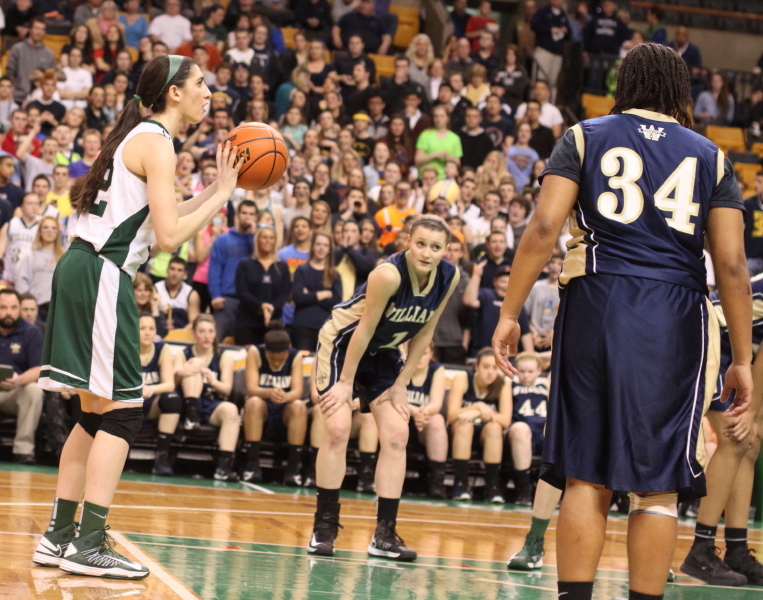 The first one gave Pentucket a 40-30 lead with 5:23 left. The second one, on the next possession, built the Sachem advantage to 43-31 with five minutes left, and the third one kept the lead at twelve (48-36) with 2:45 to go. Also in that final frame, Sarah Higgins continued to be productive. 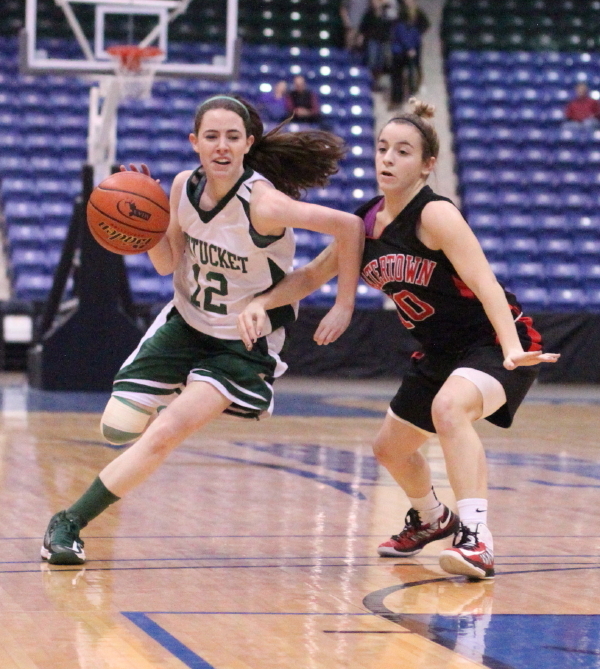 She had an old-fashioned three, a layup, and a steal and a layup by the two-minute mark. Sarah’s last score put this one out of reach, 51-38, with two minutes left and many reserves saw action the rest of the way. Basketball is a team game and every coach knows the value of having players who get the ball to scorers. Pentucket’s Alex Moore had four assists in the last quarter. 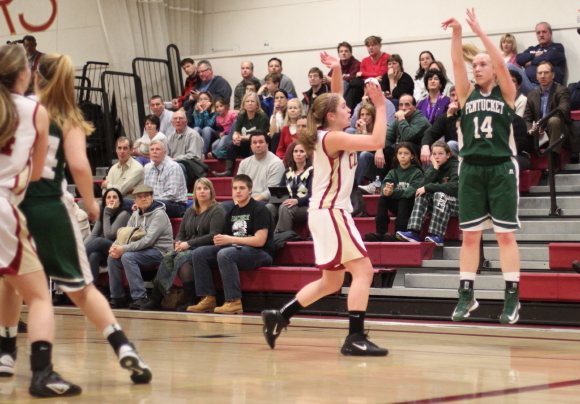 The 5-7 junior assisted Kelsi McNamara on all of her triples and also spotted Sarah Higgins in close for a layup. 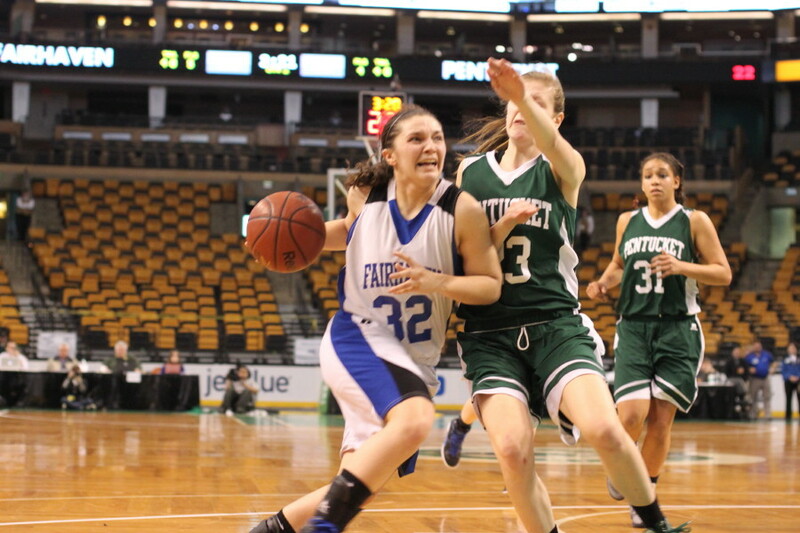 Kara Charette led Fairhaven with fifteen points. 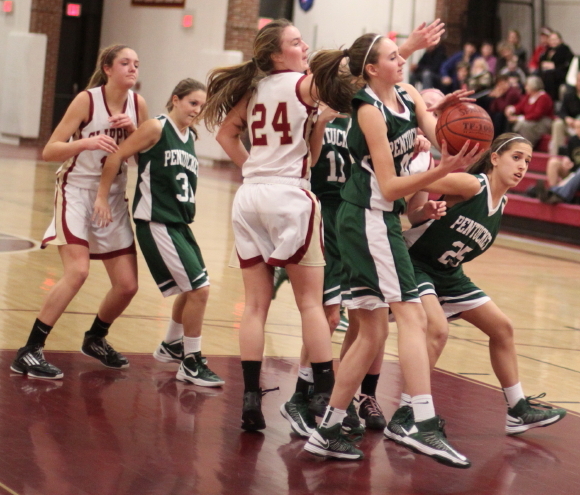 The Pentucket full-court defense double-teamed Kara to try and keep the ball away from her. 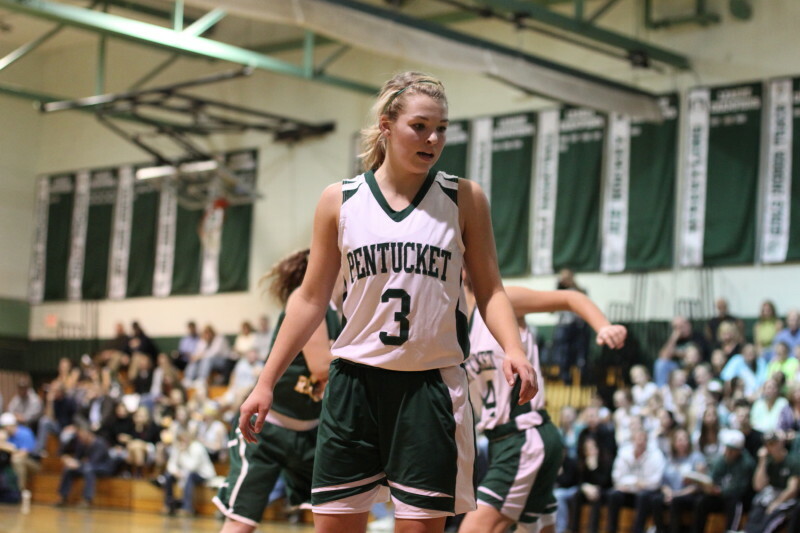 That approach paid off especially in the final quarter when Pentucket earned point separation from the Blue Devils by holding the talented senior scoreless. 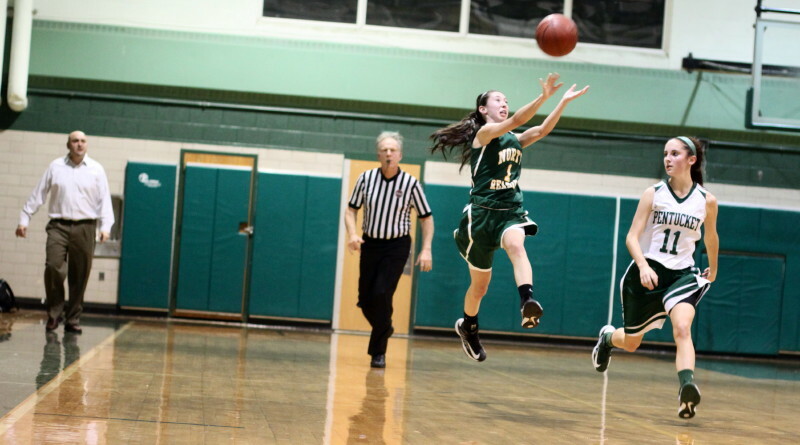 Pentucket scored the first seven points of the game (Sarah Higgins layup, Coley Viselli triple, and Tess Nogueira layup) but Fairhaven answered with six straight (Kay Mullen jumper, Ashley Brown fast break layup, and a Kara Charette converted rebound). 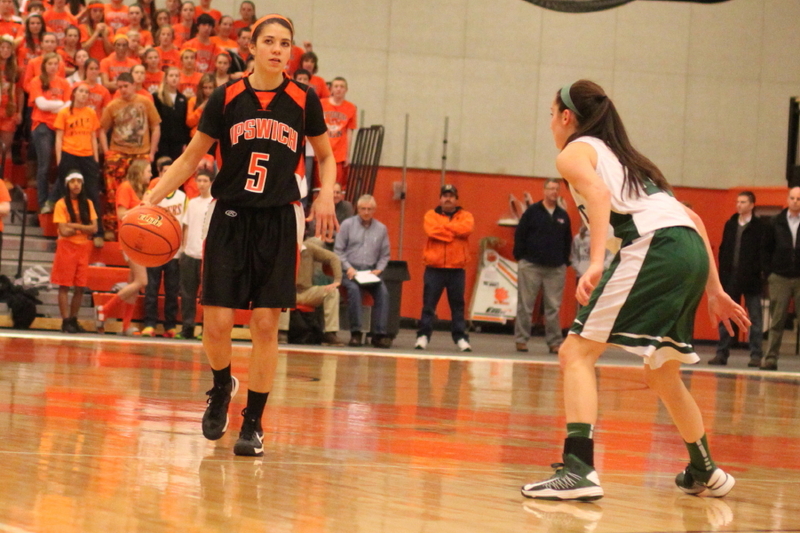 Coley Viselli (10 points) had three triples in the first half. 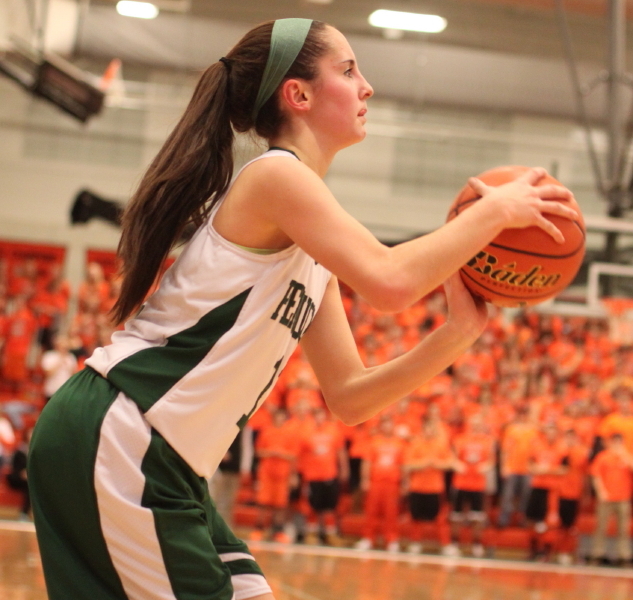 Kelsi McNamara had three in the final quarter. Fairhaven did not connect from beyond the arc. 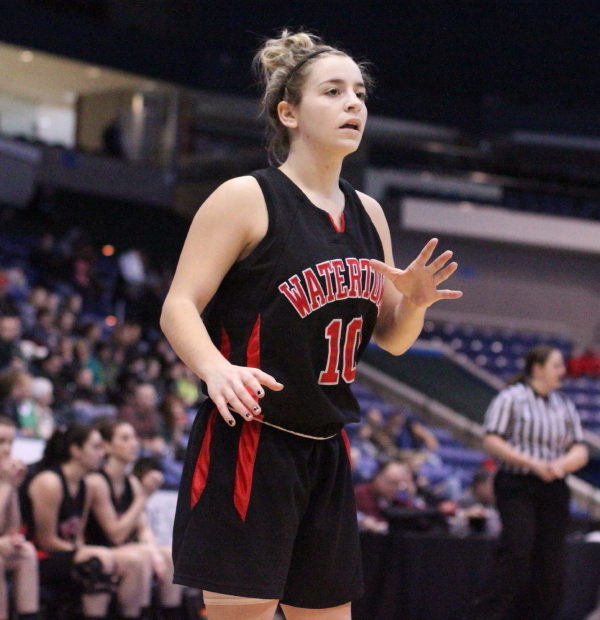 Tess Nogueira had four points and during the days leading up to this Saturday’s D3 finals in Worcester will probably be spending considerable prep time at the foul line. 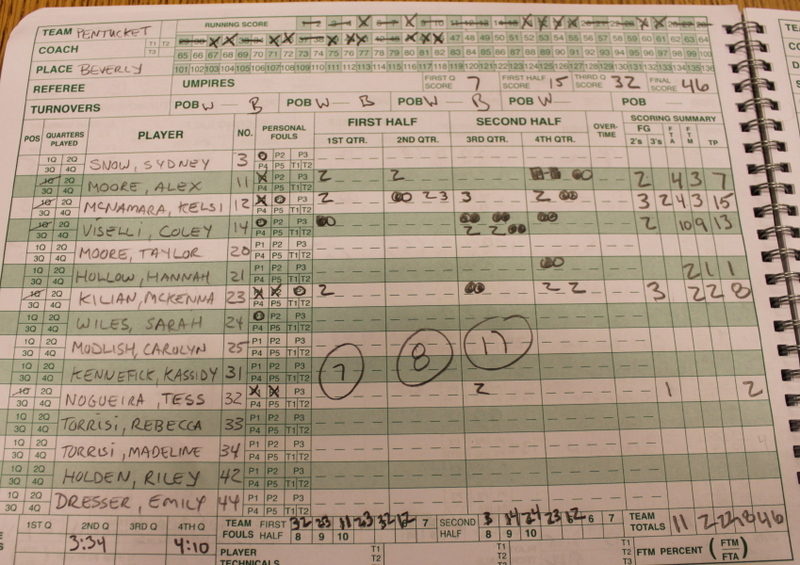 The normally reliable free-throw shooter was an abnormal 2-for-11, including one air ball, against Fairhaven. 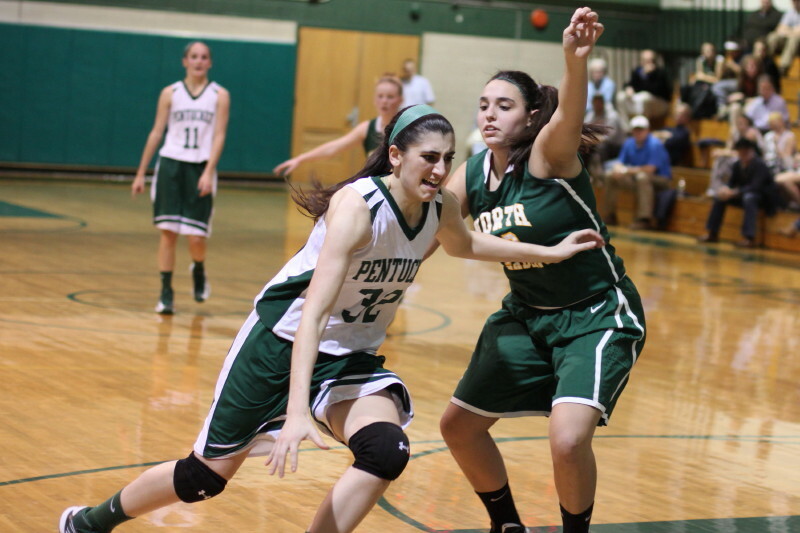 Pentucket had only six turnovers in the decisive second half. 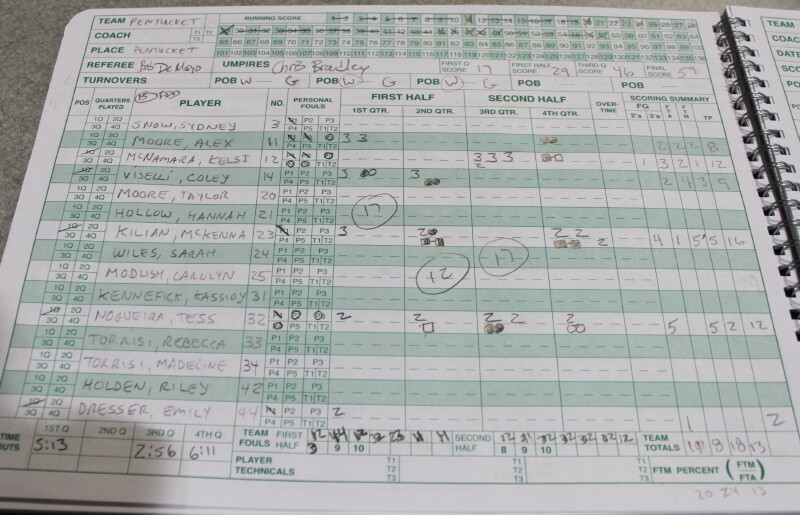 Ashley Brown had already scored seven points before she was injured. 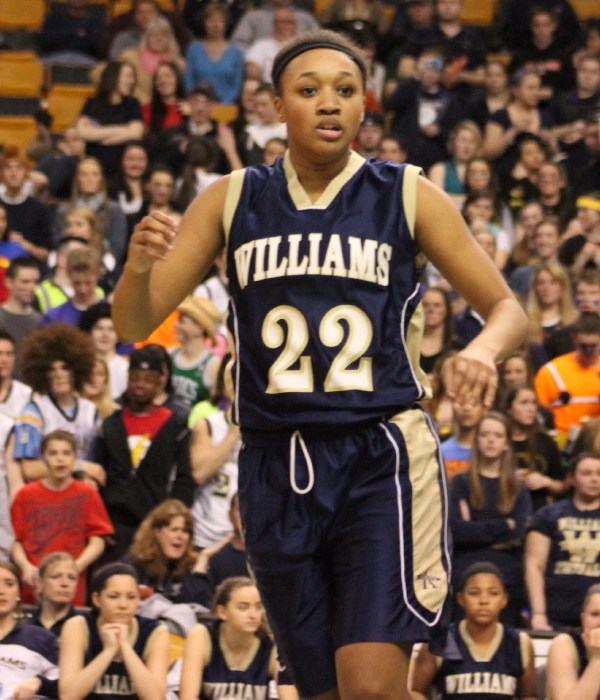 I overheard her coach say in the pressroom afterwards that Ashley usually averages fifteen points per game. I suspect that many of the Fairhaven faithful will recall this game with, “What if Ashley…….” I hope that the Blue Devil junior recovers fully for next season. 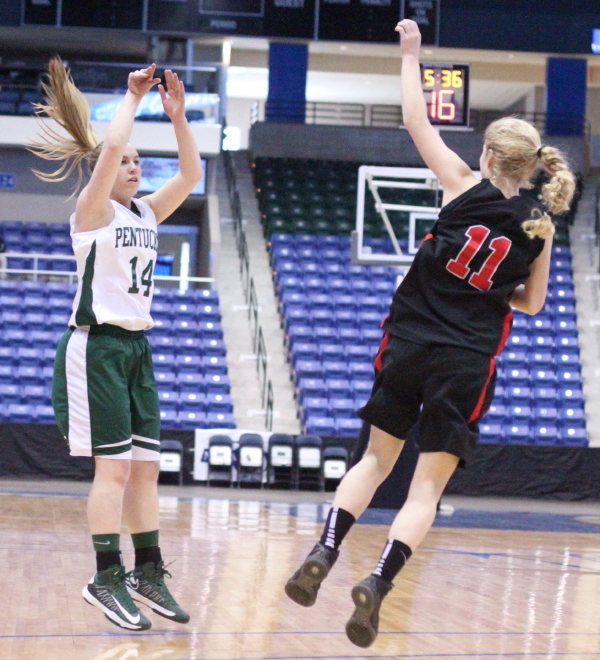 Two years ago Pentucket reached the D3 finals only to lose to Lee at the DCU Center in Worcester. Maybe this time around things will be different.